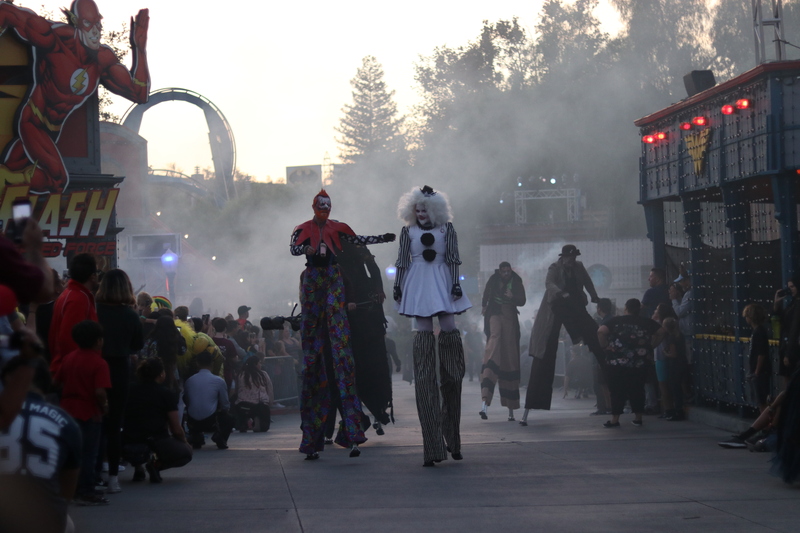 For Six Flags Magic Mountain, the 2017 haunt season is the biggest they have had in years! 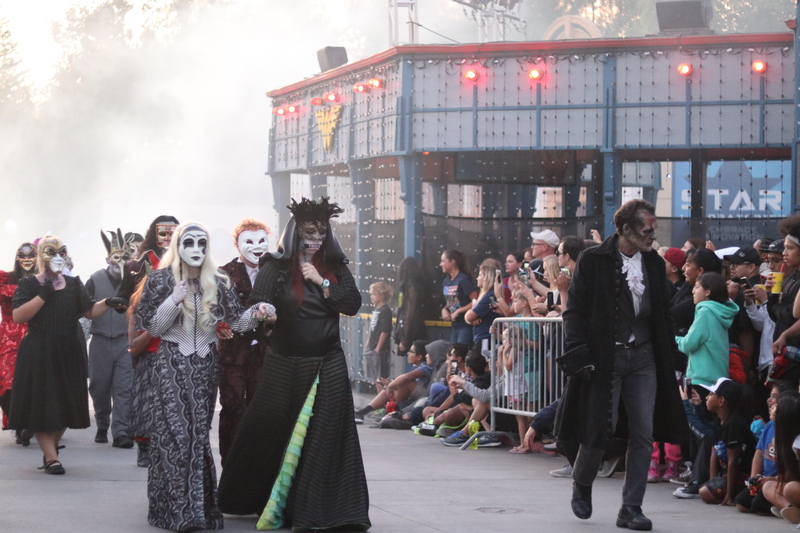 Now open more days than ever before, SFMM is setting itself up to become a major contender in the SoCal haunt world. After attending this years event, I think they are taking the right steps towards this goal. 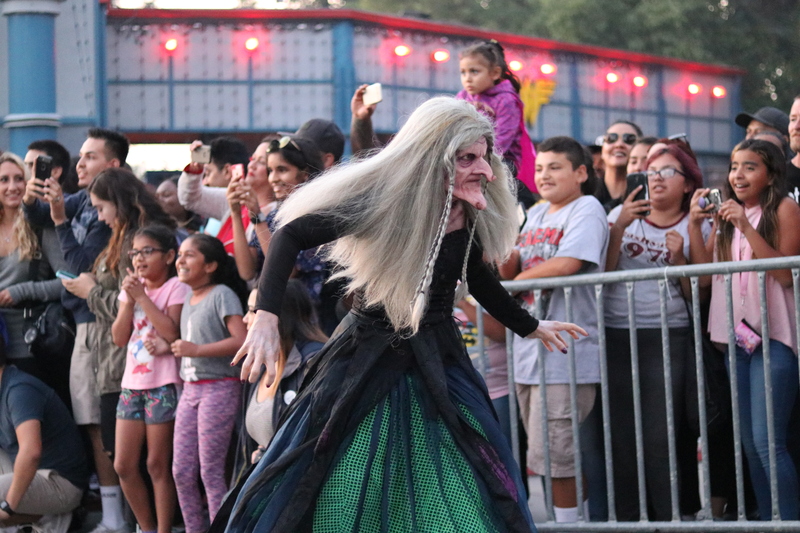 Below are what we thought of this years Fright Fest event at Six Flags Magic Mountain! 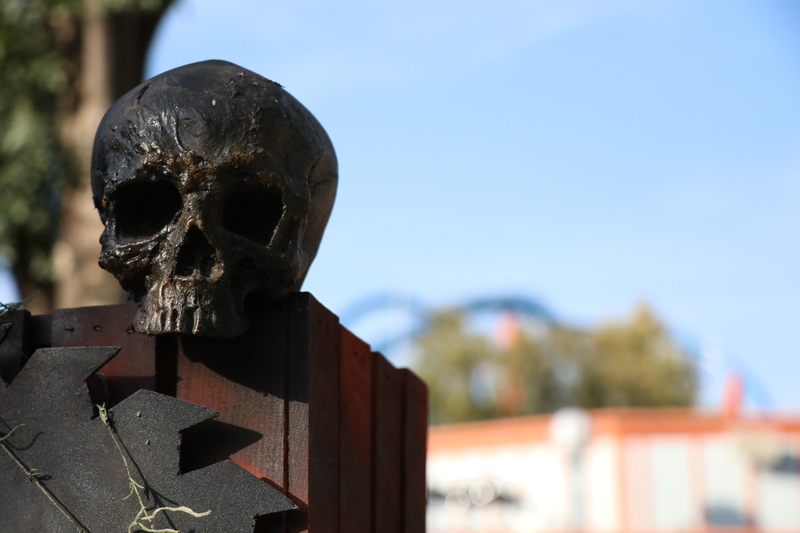 The first thing we did when we got to the park was take some photos of scare zones during the day. Sometimes it’s nice to take a chance to appreciate the beauty in the props and decor before the lights go down and the monsters arrive. 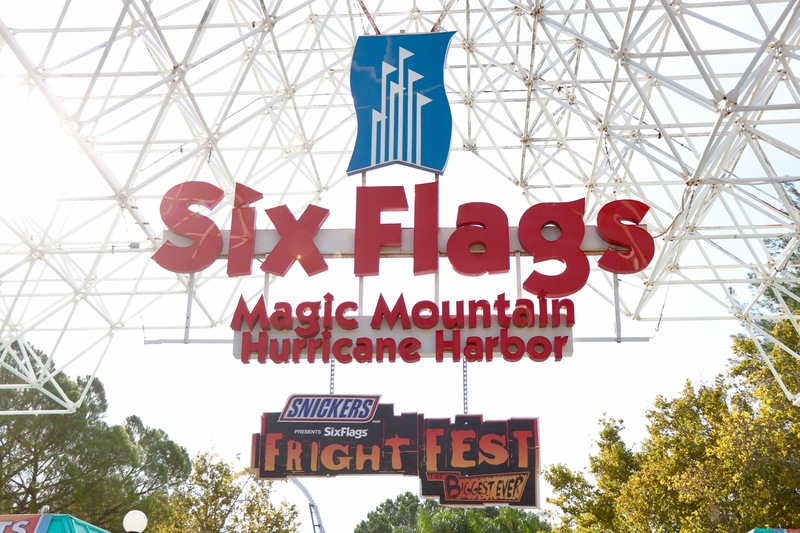 As you pass the security check point, the split between Hurricane Harbor and Magic Mountain is decorated to promote Fright Fest to oncoming guests entering either park. 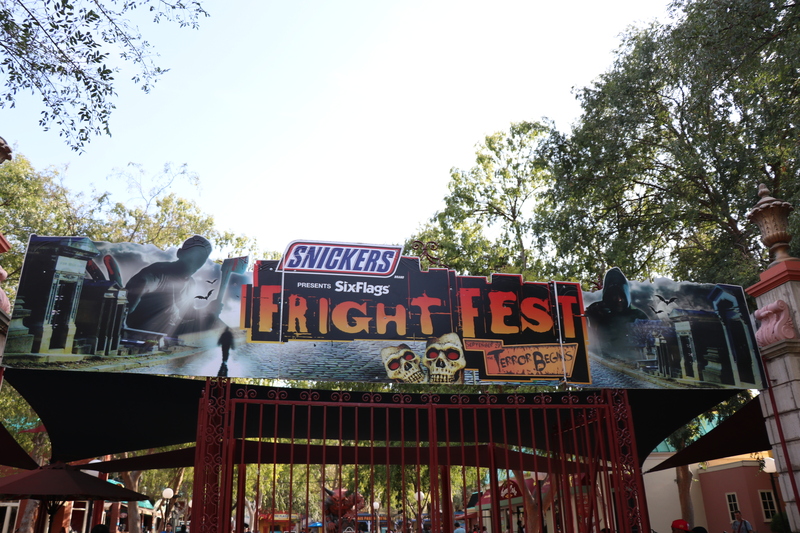 It could just be me, but I feel like the main gate sign for Fright Fest is the same each year. I would love to see it changed up and have something a bit more imposing and scary. 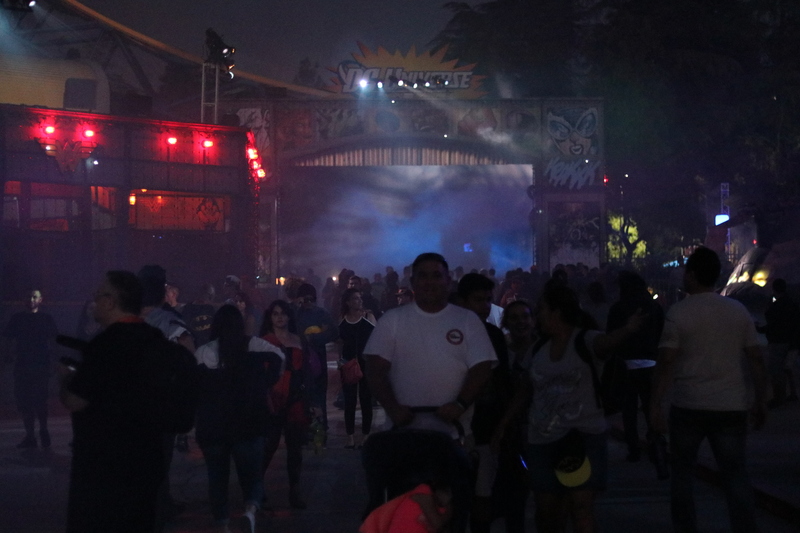 Something to really set the mood, although you can see the first scare zone of the park right past the entrance. Not sure what your idea of scary or imposing is but I would say that these massive demon statues count! 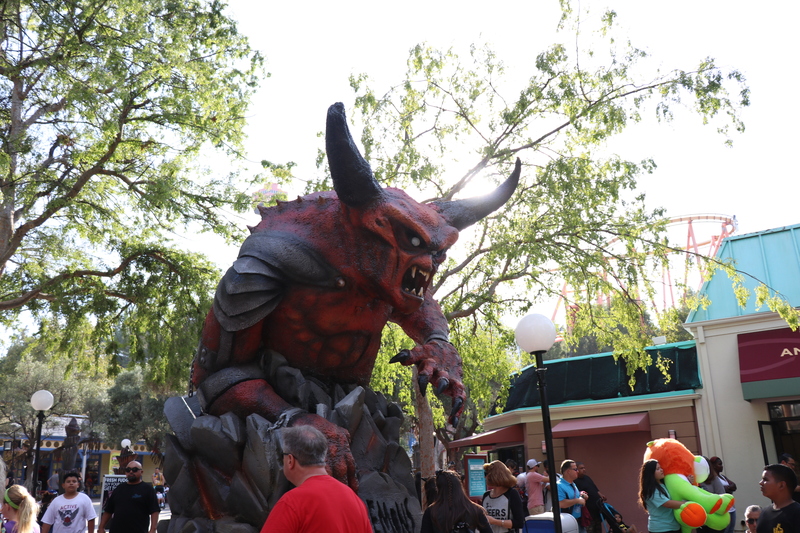 This is the entrance into the park and you have to pass through Demons Door! 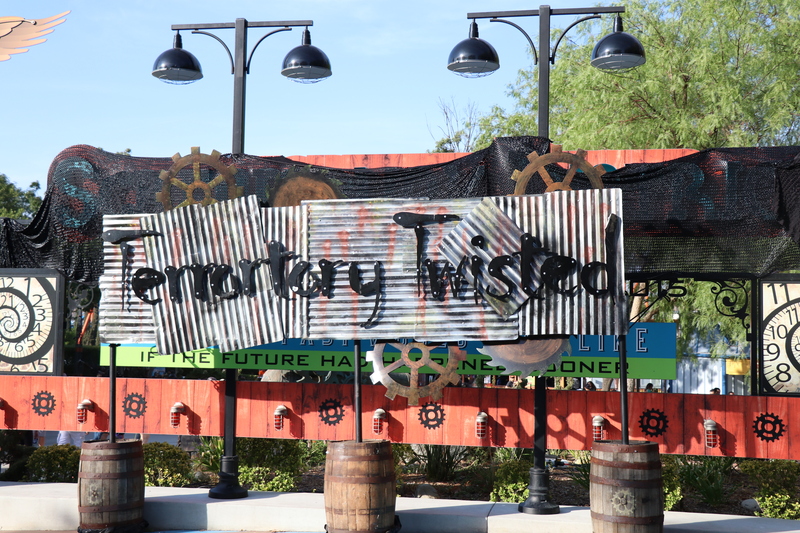 Over by Twisted Colossus in the Screampunk District is Terrortory Twisted! 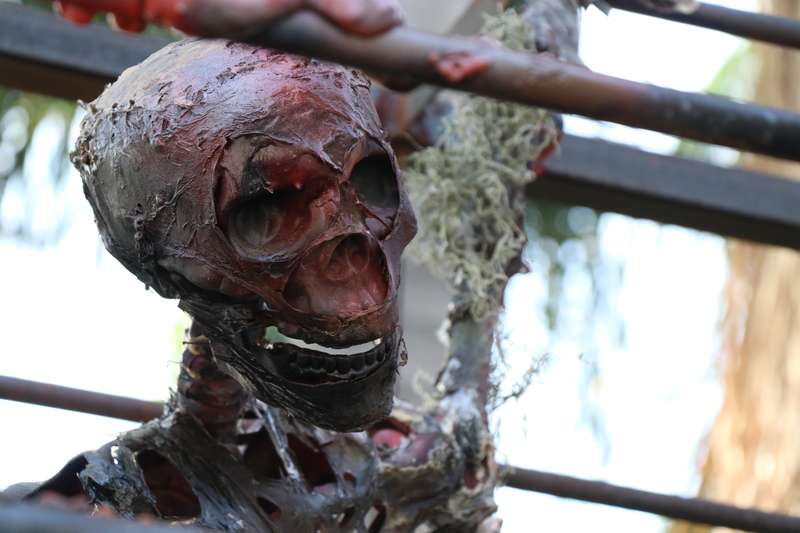 Probably one of our favorite scare zones, it is wonderfully decorated with many disturbing skeletons and dead bodies! 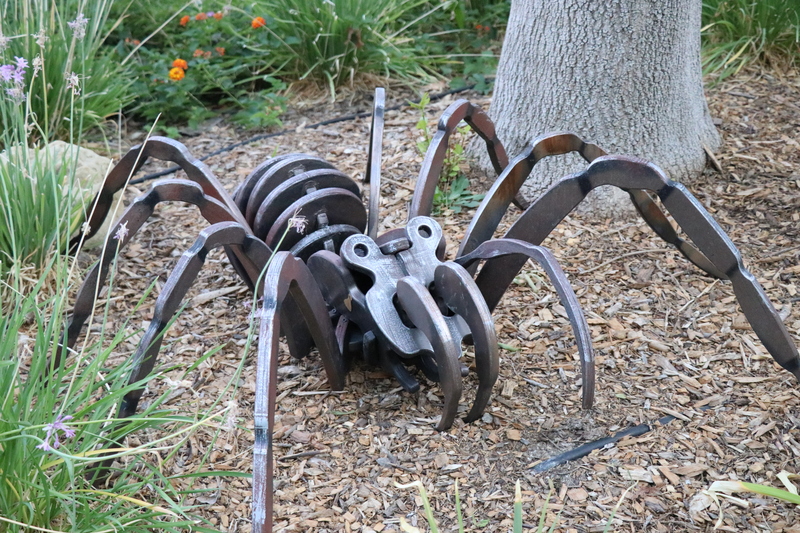 We found this gear spider to be kinda cute…during the day that is! 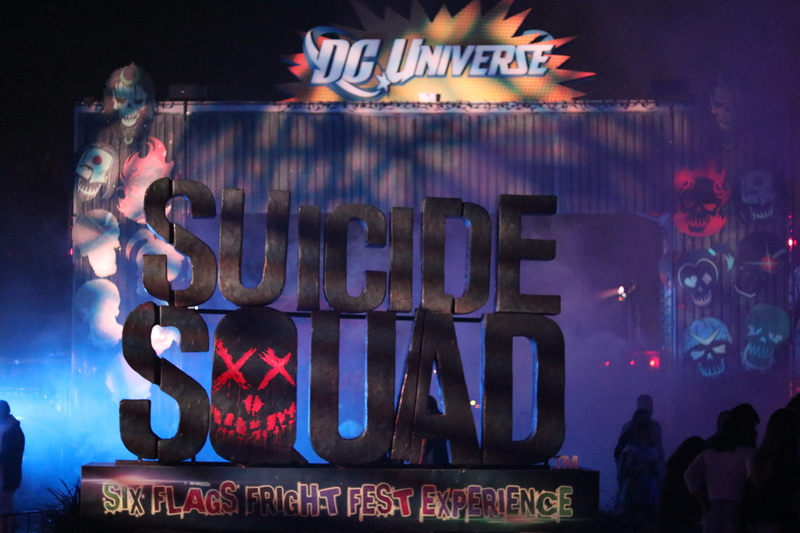 In the DC Universe area is the Suicide Squad Experience. 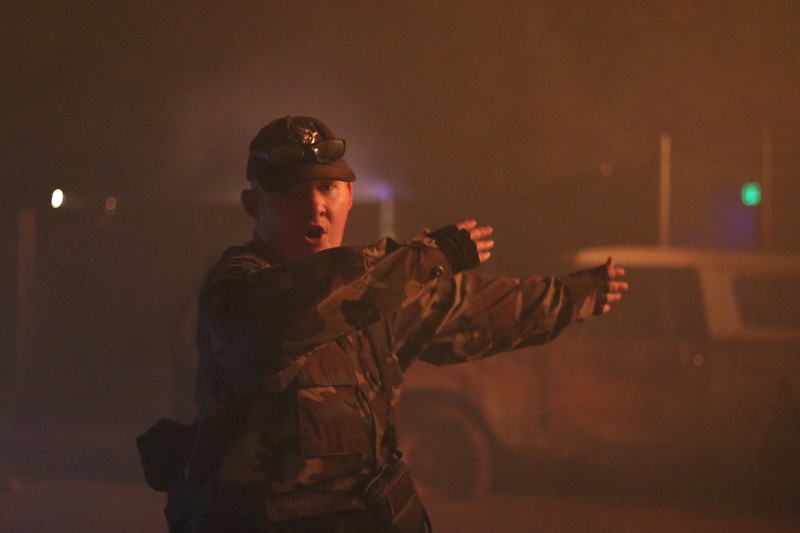 Technically not classified as a scare zone, it still has scare actors walking around scaring folks. 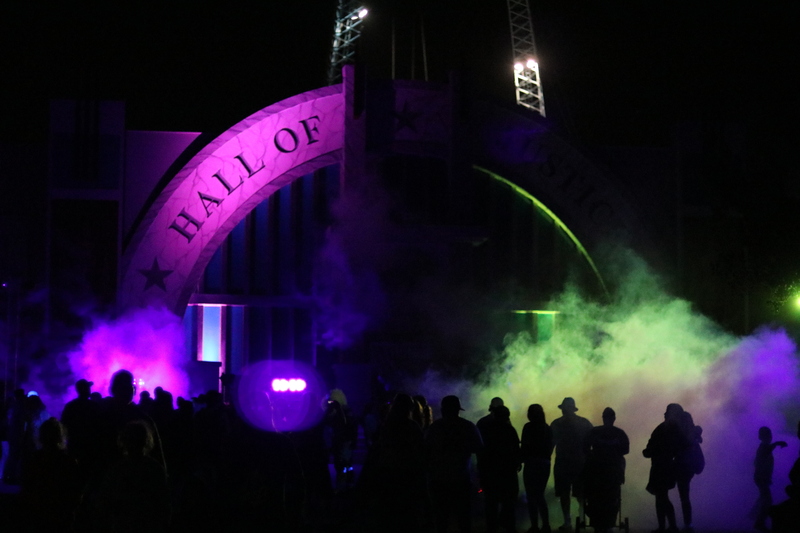 Not to many decorations to see here, it is mostly the setting of DC Universe mixed with lighting, fog and fire effects. 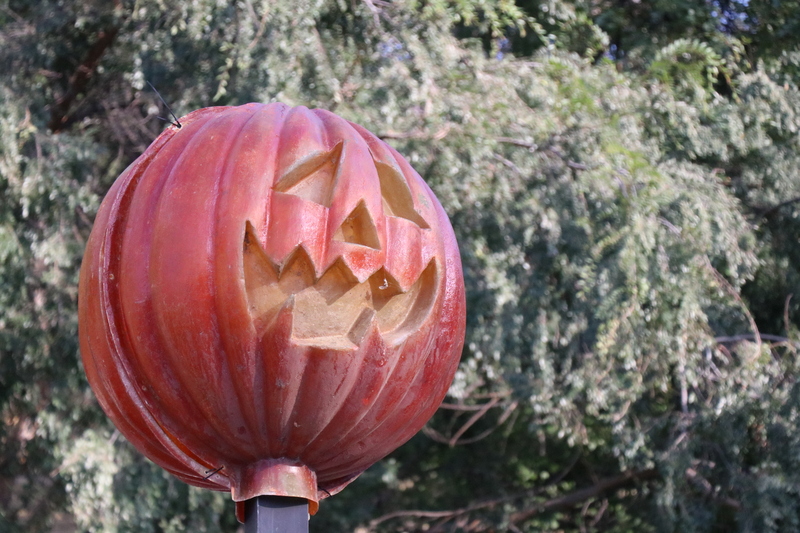 We posted this on twitter and Facebook, but we LOVE these jack-o-lanters that covered the lamp posts on the way towards the new Justice League ride! We wish we could see this more throughout the park! Finally, here is the facade for Willoughby’s Resurrected! After walking the park for a bit, we went over to the Metro Park Pub, right behind The Hall of Justice (which is the facade for the new Justice League: Battle for Metropolis Attraction) to get some food and drinks to fuel up for the nights festivities. 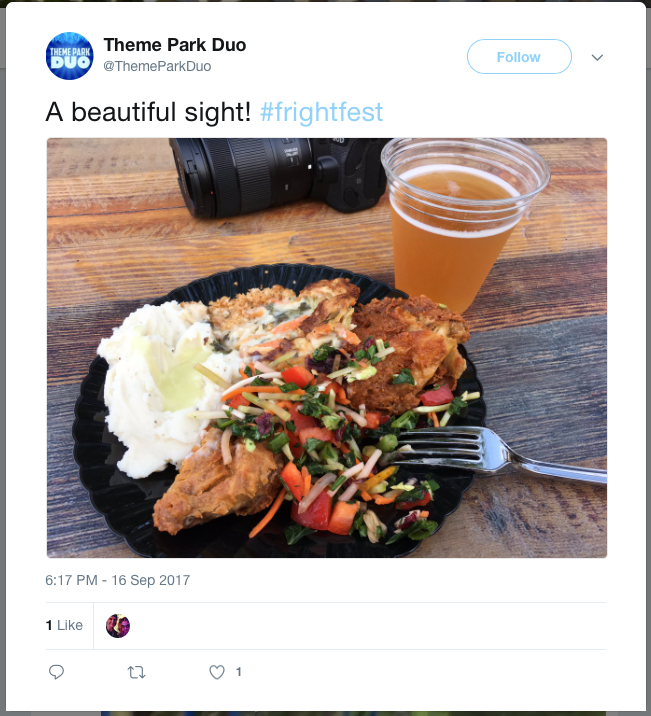 There are many tasty food offerings to be had at Six Flags and we got to sample a few prime selections, along with wonderful beer and wine from the 6 Feet Under Club! If you ever get hungry while at the park, this is the place to go for some grub and libations! 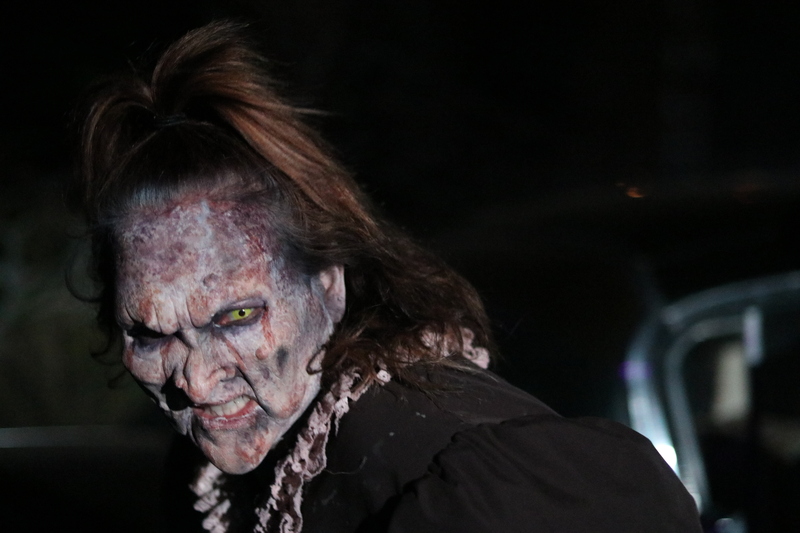 Of course it wouldn’t be Fright Fest without the amazing scare actors that roam the streets of Magic Mountain! Something that I think SFMM has over the other competition is Scott Ramp! 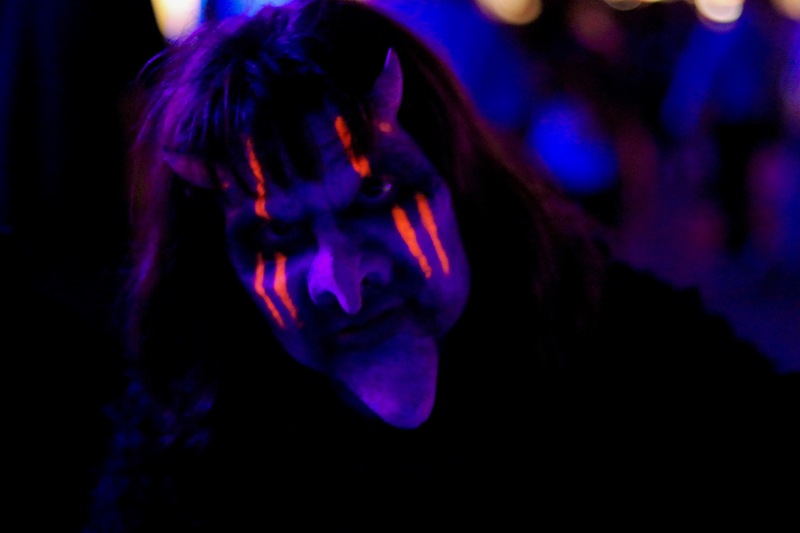 This amazing person is the mastermind behind the incredible makeup and prosthetics of the event. 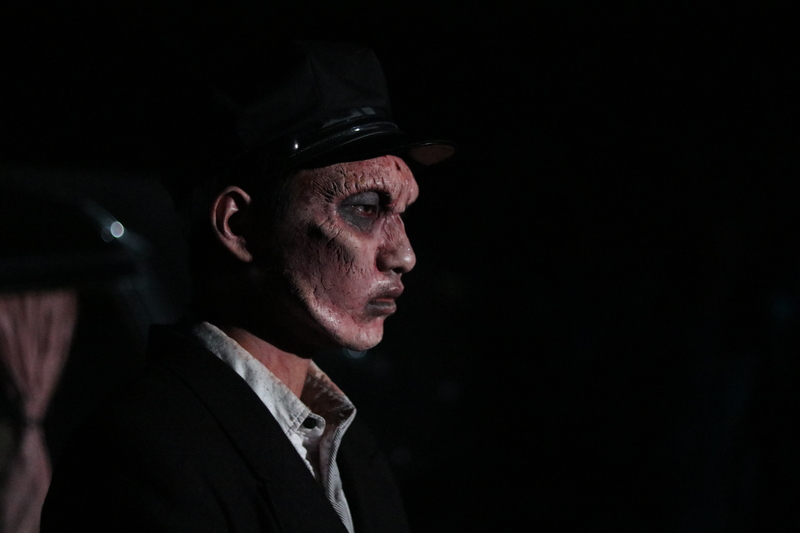 I am one to believe that this sets them apart and a step above most events (in the makeup effects department). If you want to check out The Scream Team, check out the website by clicking HERE! After we ate, we went over to the entrance of the DC Universe area of the park to watch THE SURGE! 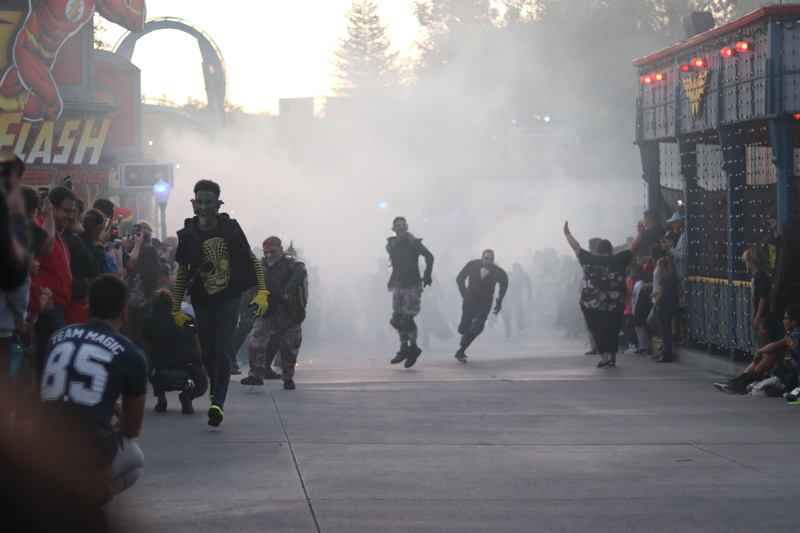 The Surge is how all the monsters enter the park together, since the park never closes before the event. 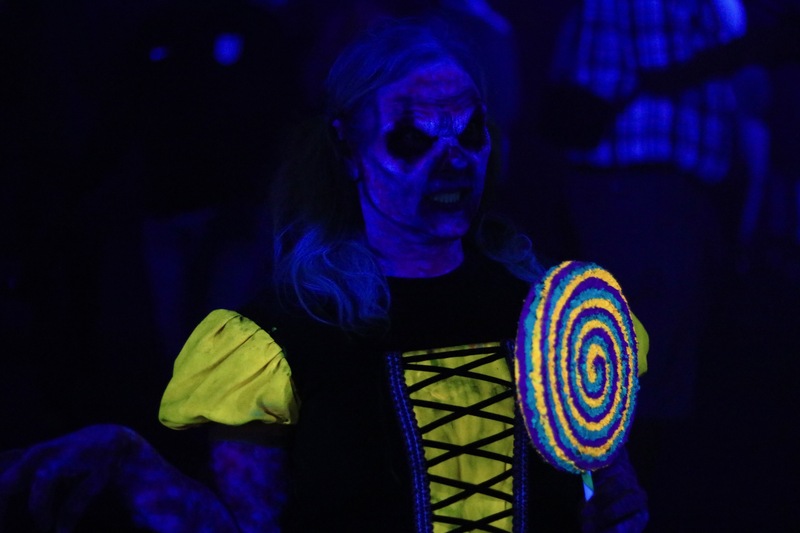 We think The Surge is such a fun bit of entertainment to get the guests pumped and ready for Fright Fest! The music is thumping, the monsters are sliding and after it’s all said and done, you are on your own to find them again, but this time they will also be looking for you! After The Surge, we took our time and waited for the sun to set a bit before venturing out into the park. We wanted it to be nice and dark before we started to get scared. That is the only true way to experience any haunt in our humble opinion. Everything was designed for night time! 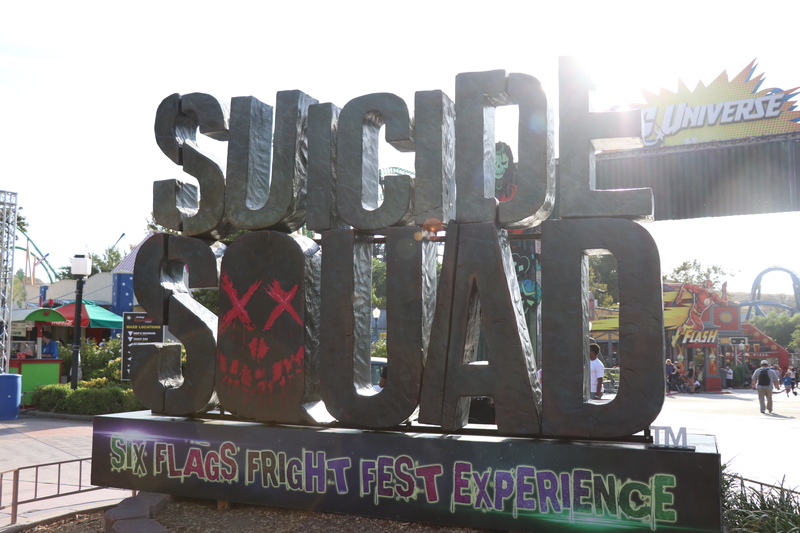 The Suicide Squad: The Six Flags Fright Fest Experience! 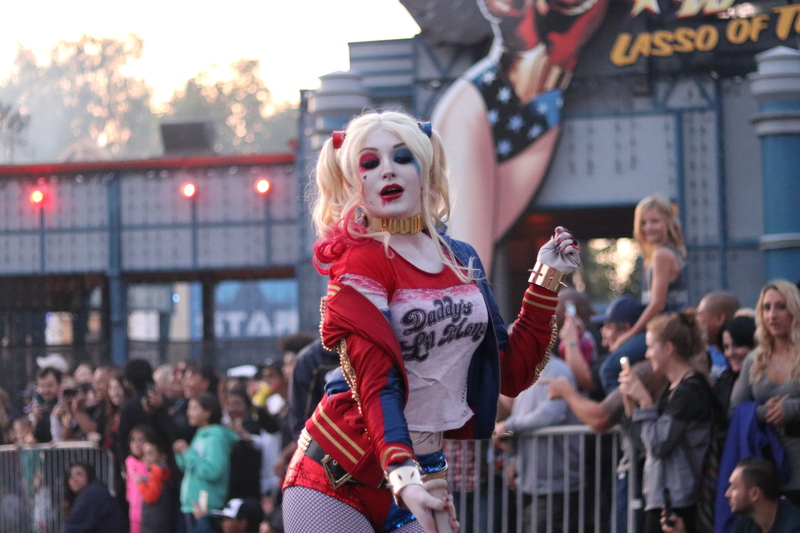 Transforming the Park’s DC UNIVERSE area into DC’ Midway City, you will find some of the “Worst Heroes Ever” from the film Suicide Squad will be roaming the streets. Darkness and chaos will reign as some of DC Comics’ most famous Super-Villains will be found among the mass destruction from the film. 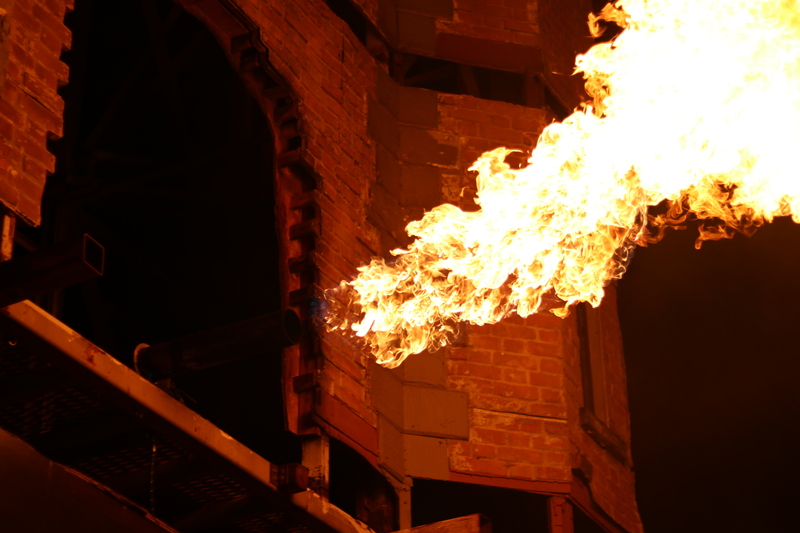 State-of-the-art digital imagery and fiery special effects will create an inferno as buildings burst into flames and creatures attack from every angle. 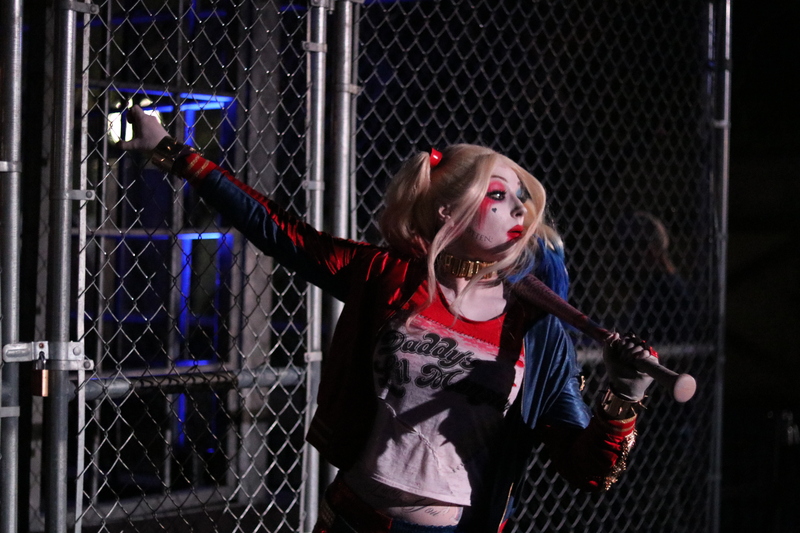 “It feels good to be bad” at Suicide Squad: The Six Flags Fright Fest Experience. SUICIDE SQUAD and all related characters and elements © & ™ DC Comics and Warner Bros. Entertainment Inc. The first major building on your right hand side as you enter the area has an incredible map projection on it! It constantly changes and we happened to catch it as it displayed The Joker’s face all over it! Sometimes, projections of the monsters from the movie run on the building too. It is actually very fun to watch, especially when the fire effect go off on the roof of the building. Also it gives the monsters a chance to scare the living day lights out of you when you are just standing there. We did see this projection COMPLETELY freeze during the night, but I would chock that up to first night errors that usually get ironed out the second night. As you can see in the pictures below, there is plenty of thematic lighting and fog to make the place a bit more spooky than it already is. 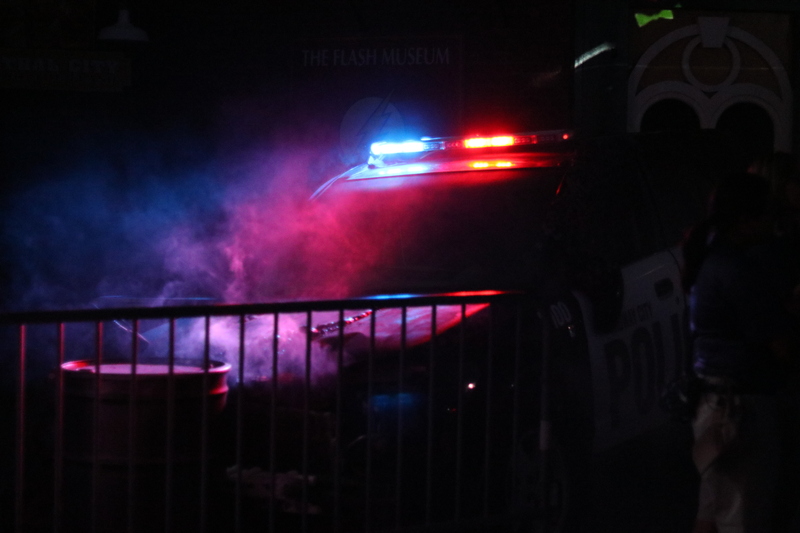 On top of that, there are some police cars, taxi’s and other bits of decoration to set the theme of Suicide Squad! One special thing they do here, that they do not do anywhere else in the park, is have meet and greets! Now you may be asking yourself, why would I want to meet and greet a monster? Well they aren’t monsters, but the actually Suicide Squad characters themselves. Fans of these characters line up early and wait for a one on one interaction with their favorites. Last year, they had the same characters but one less it seemed. We did not see Killer Croc at all while we were there, maybe he will show up later in the season. Who ever they get to play these characters are wonderful! They stay in character and exude everything that character represents. 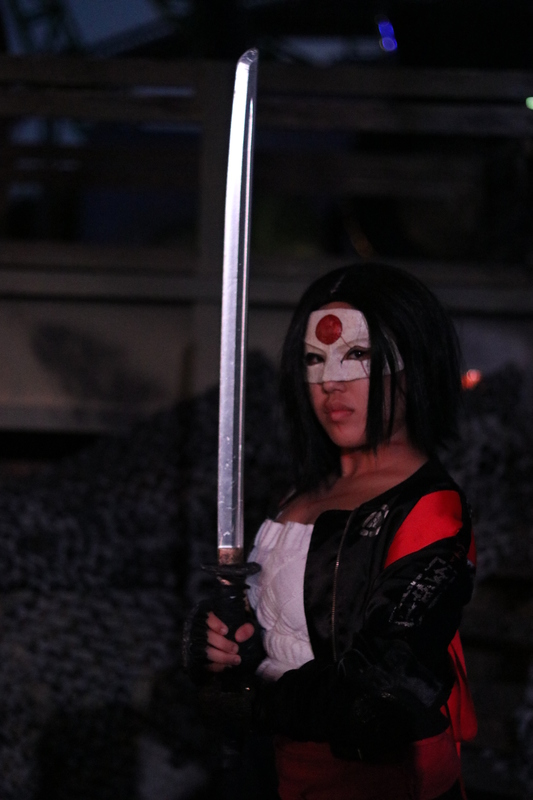 Katana is silent and bold, Harley Quinn is cute, funny and approachable, and The Joker is just down right disturbing and scary. Awesome job with these characters! 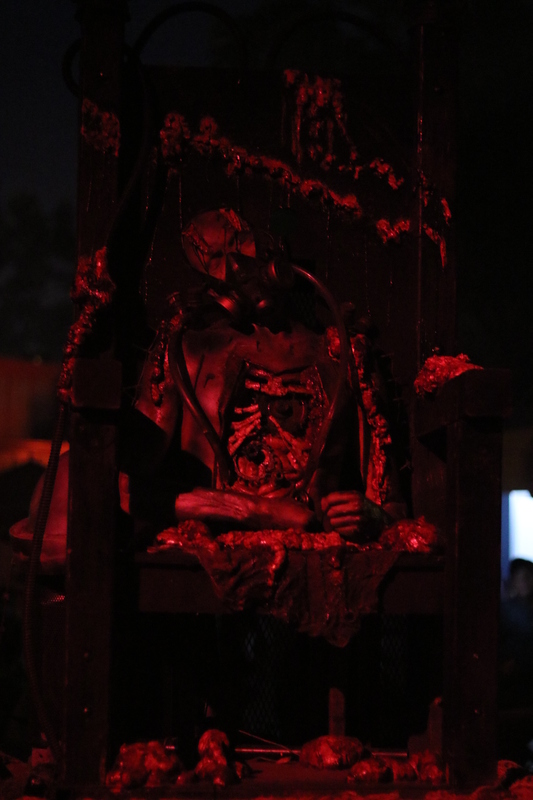 We loved this scare zone last year and we love it this year. 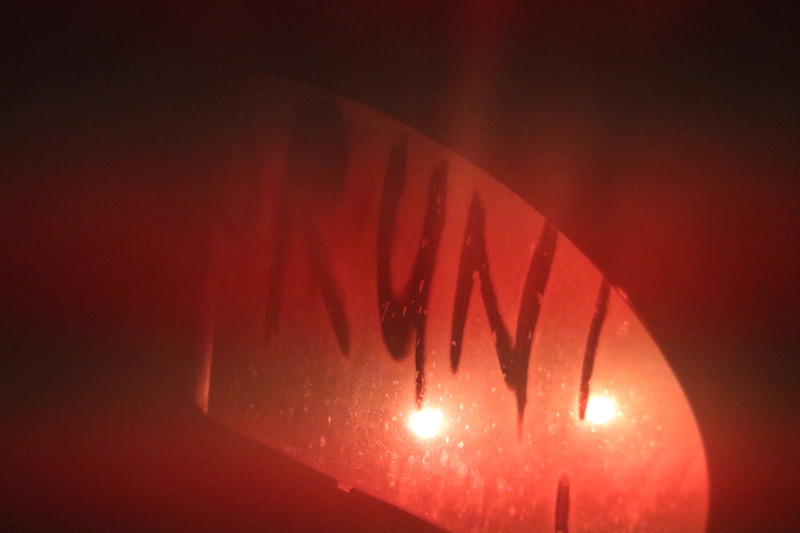 Dark, filled with fog and flooded with a blood red light; this scare zone hits on all cylinders for us! 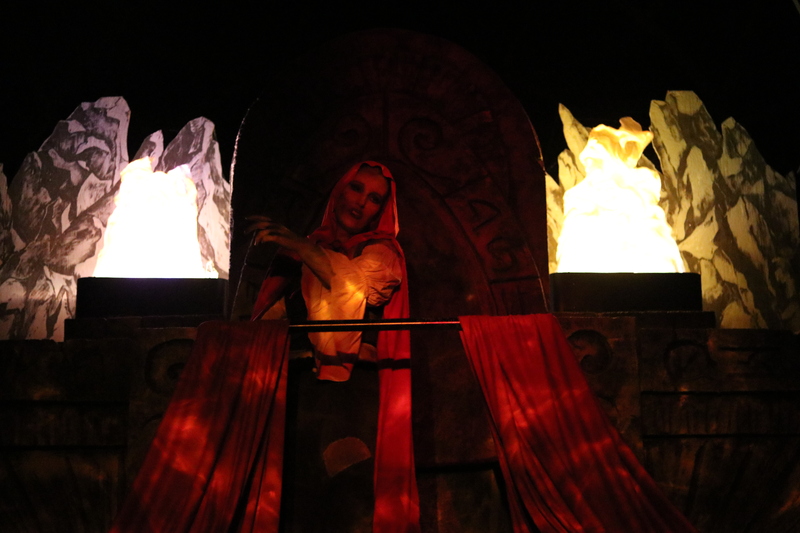 It also has wonderfully scary decorations that were creepy during the day but utterly terrifying at night. 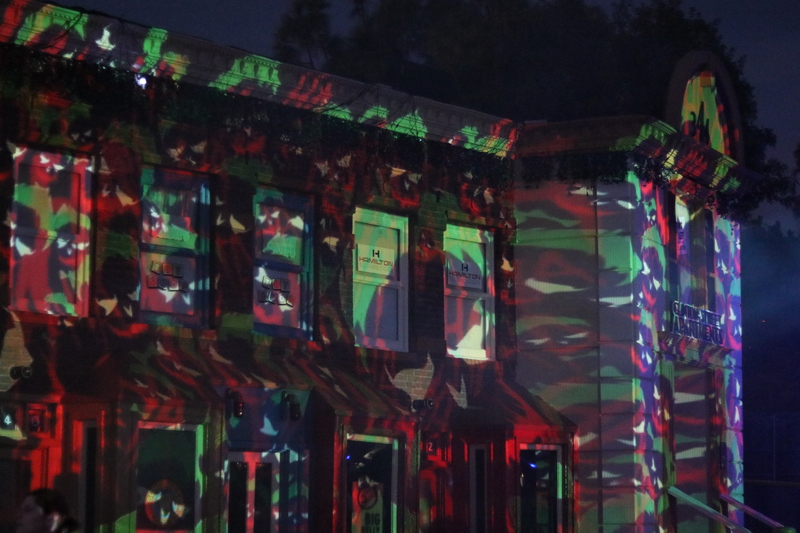 Not to mention some amazing projections on the building near the entrance of the scare zone. It was a beautiful sight to see with fog shooting into the sky and the light cutting through it. A must see if you are visiting the park! 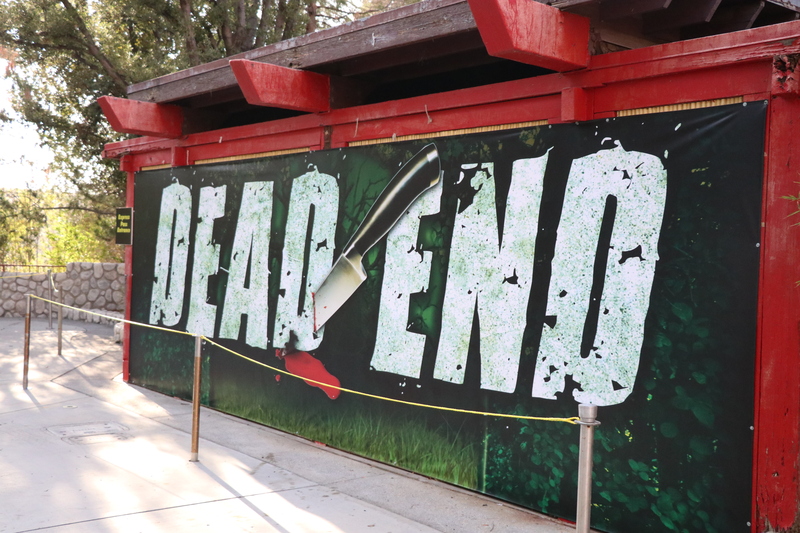 After we finished up, we went towards the BRAND NEW maze, Dead End! 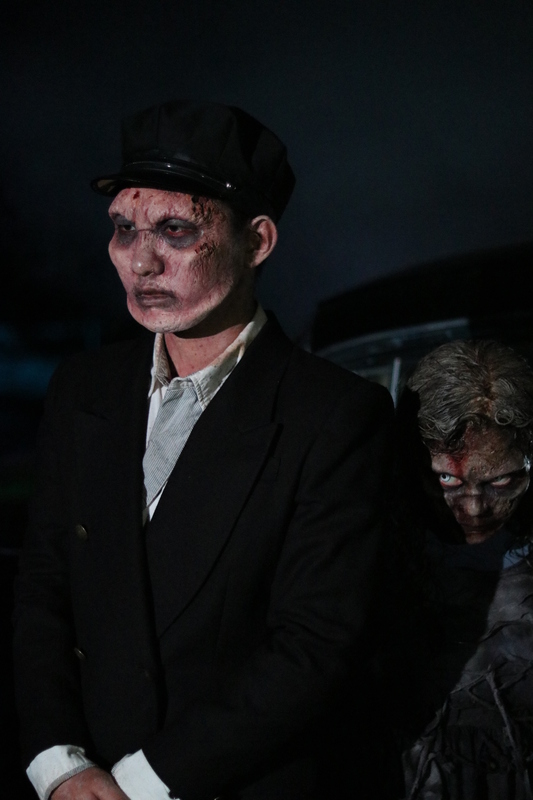 The dead have risen and are looking for new souls to take on this dark and sinister hill. They are relatives of the Willoughby’s and protect their haunted estate at no cost. Keep all senses on high alert, you never know what type of characters might be hanging around at the top of the hill. Exile Hill is another Six Flags classic! 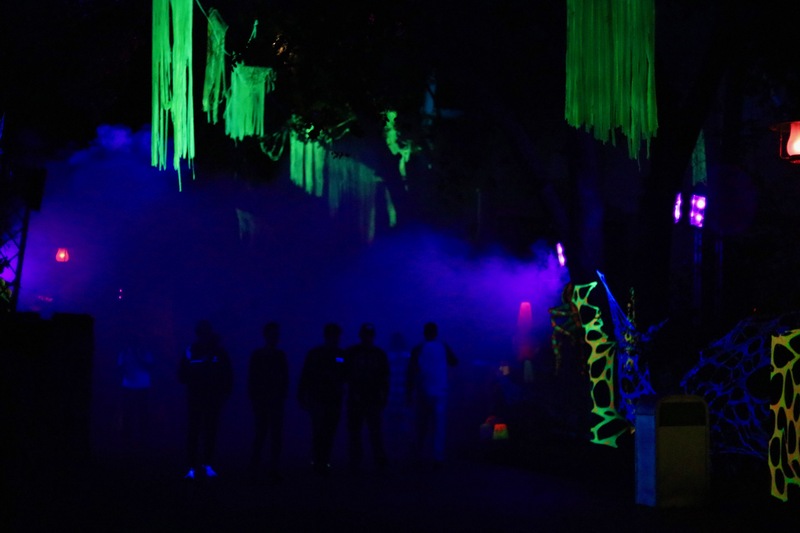 I never want to see this scare zone leave and I don’t think it will because of it’s direct connection to the Willoughby’s Resurrected maze right next door. As long as that maze exists, so will Exile Hill. 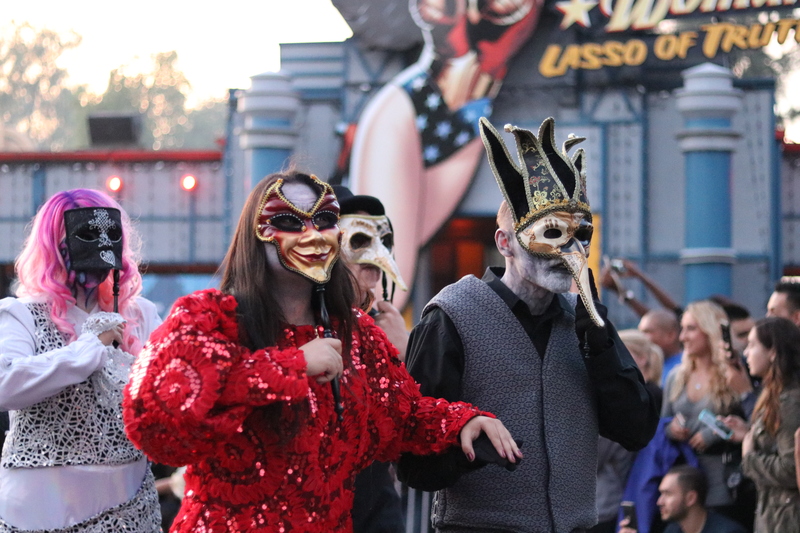 They have plenty of monsters roaming this area which include sliders and a stilt walker. Such a fun and traditional scare zone that is effective and scary. If you find yourself in this area of the park, find somewhere to sit and enjoy what these monsters are able to do. 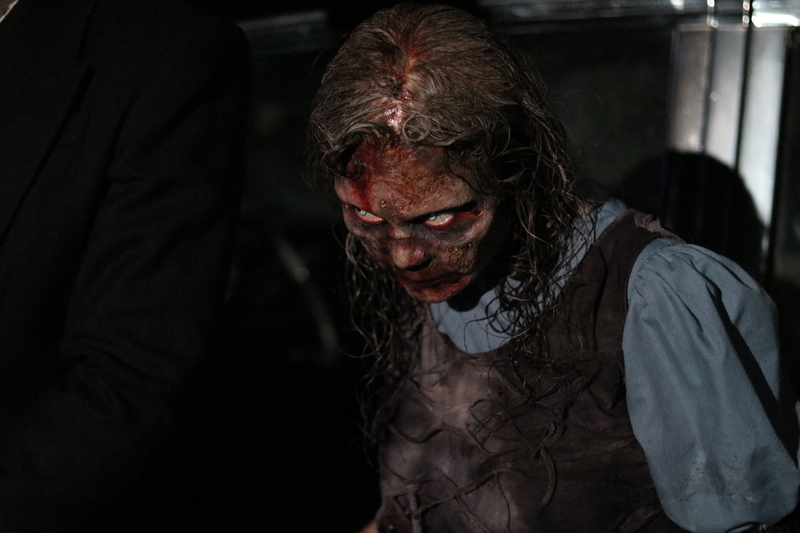 In this scare zone lives one of my favorite scare actors at any haunted event, Innocence! (Pictured Below) She is incredible in so many ways. Menacing, terrifying and scary all without resorting to any typical scare tactics. She quietly and slowly walks towards her victims and they always react. People are so unnerved by her silence and slow pace that they tend to race far away before Innocence gets anywhere close to them. 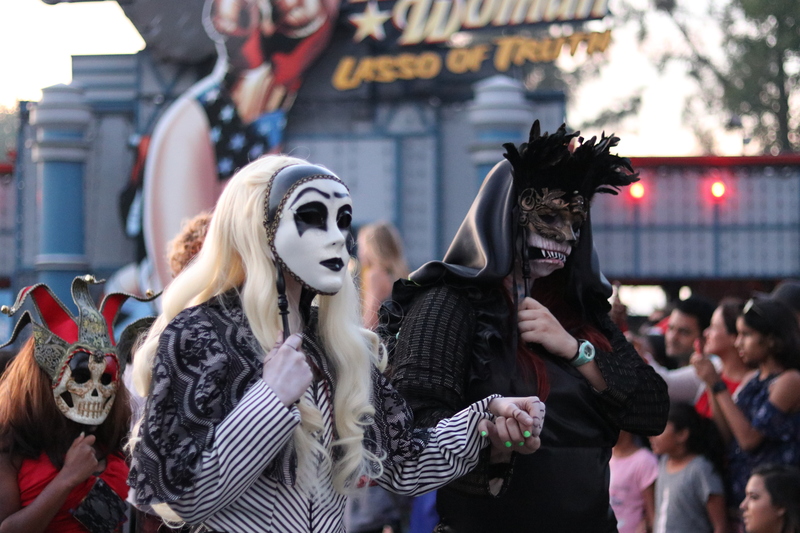 No other monster has that type of impact on their victims….guests. 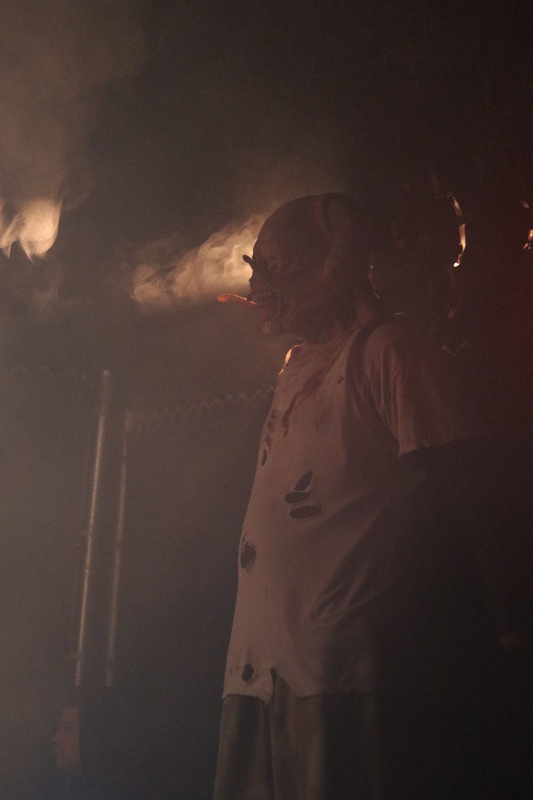 This scare zone was rather high energy for being filled with dead people! Every town has a group of teenagers that seek thrills for breakfast, lunch and dinner and can never leave well-enough alone. It made them popular among the kids at school, but it was only a matter of time before something went wrong. One afternoon they decided to break in to the old, abandoned house at the top of the hill on the dead-end road on the edge of town. Rumor had it that the old man who lived there had been there for four weeks, dead as a doornail, before he was finally discovered – and now the house was haunted. 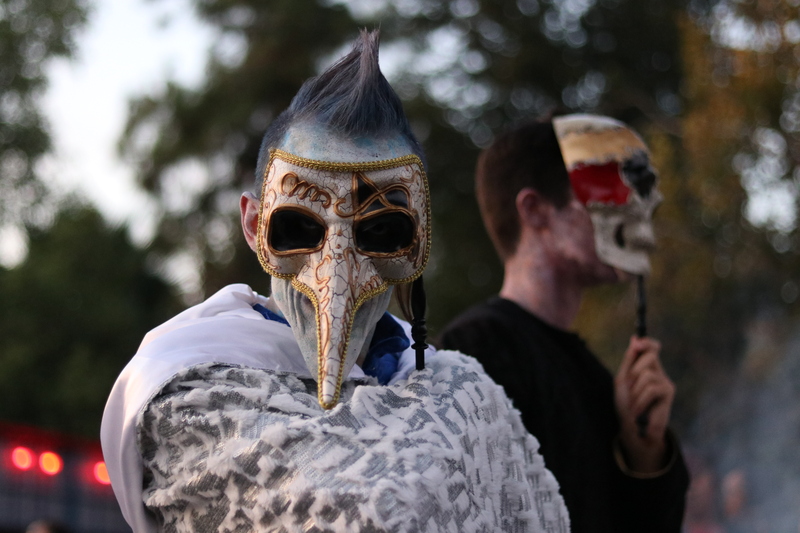 This daring group set off on a fall evening, storms lurking, to prove the rumor wrong. However, as soon as they entered the house, the severe storms surfaced and took out the only power plant in the whole county. Just like that, they were in total darkness never to be seen again. The line for this attraction goes right in front of the sign so we were not able to snag a photo of it at night. But do we have many thoughts on this attraction that is NEW for 2017. 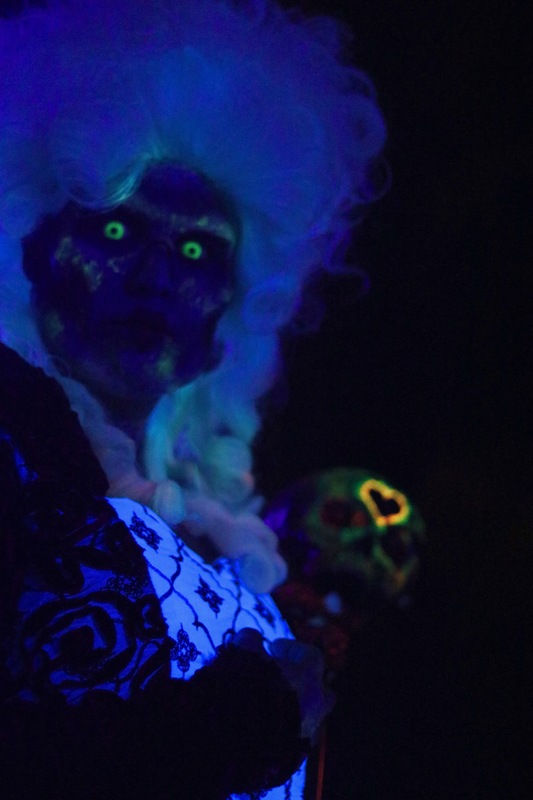 We love seeing parks and haunts stepping outside the bounds of what would be considered a normal maze. With regards to Dead End, SFMM is doing just that! This maze hands a flashlight to the leader of a group of 6-8 people and they have to navigate their way through a pitch black maze while the flash light flickers, changes color and goes out all together. This is a very fun concept that would work perfectly well if executed correctly. Unfortunately, Dead End seems to be DOA. There were just many logistical problems with the operations of this maze along side its lack of set design and theming. You must be asking yourself, why would they need theming if its in the dark? 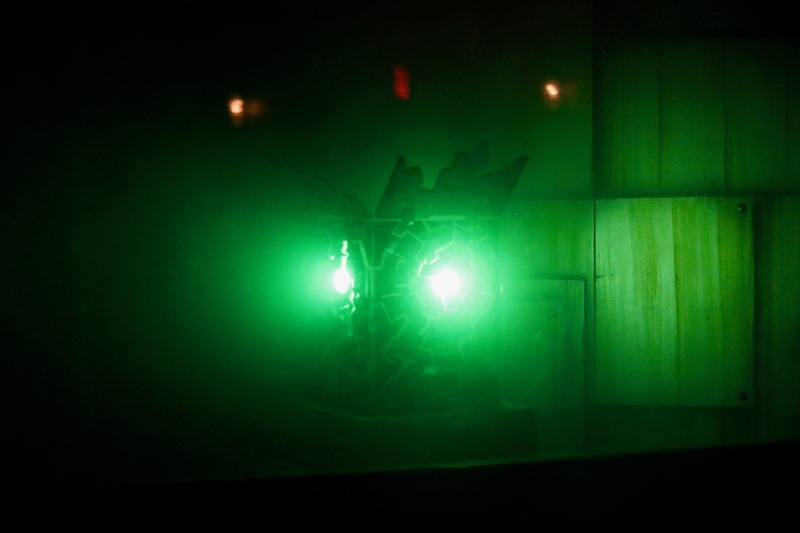 Well occasionally through the attraction, the light flickers and changes color, but when it does, you are either met with black plywood walls or a lightly decorated room. The lack of set design leaves guests wondering what the theme or plot of the maze actually is and nobody reads the maps to figure out the backstory for the mazes. Even with mazes that are straight forward, people still do not read. Also, the changing of the color doesn’t really have a purpose. Usually it is to reveal some hidden messages, but it just seem to do it randomly. I think SFMM did a great job in creating an overwhelming sense of dread and tension. But once the first scare happens, you know exactly what to expect. 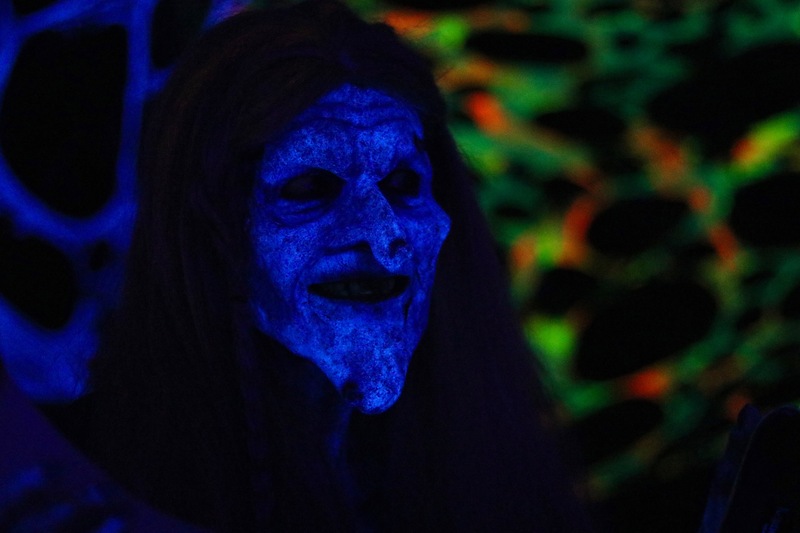 All the scares were people screaming as loud as they could through the attractions and you could hear it happening before you can even get to the next room. This could have been the perfect opportunity to sneak up behind people and whisper in their ears to really freak them out! I would also lessen the amount of people in each group, because the people at the back are literally left in the dark. The scares only really effect those who are at the front of the group. Ultimately, the one dimensional scares and lack of set design really set this new maze back. I would love to see this return next year with added sets, story and characters. I think it’s a fun and smart concept, but it needs a bit more to take it to the next level. The manor on Sky Tower Lane was the largest and oldest dwelling on the block. The owners and residents, Mr. and Mrs. Willoughby, have not been seen in almost a year. And oddly the mansion never has visitors or even deliveries. Extended family members seeking profit had asked around the town in hopes of finding their family and possibly renovating the abandoned property to make it beautiful to sell. After time had passed, they sent workers to the property without ever finding the owners. Groundsmen and construction sent to the house to make estimates and survey the land would never be seen again. So, are you able to find the missing Willoughby family? 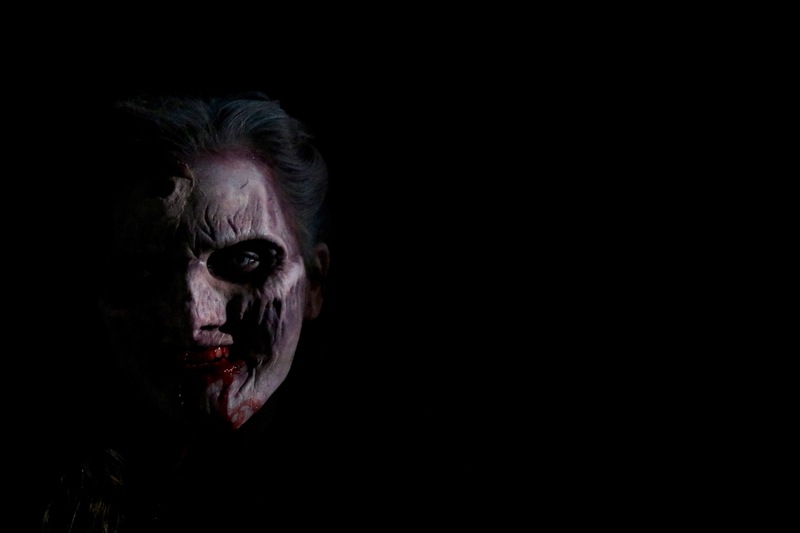 As you roam the house for clues, beware when the lights begin to flicker. 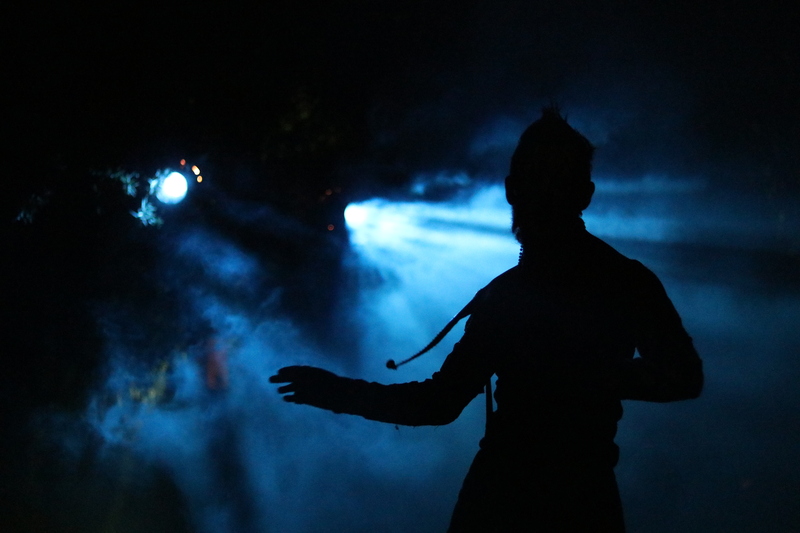 If you see any flashes bright light or feel the breath of cold air on your neck, you will know the Willoughby Mansion’s evil spirits have been resurrected! Now, at Six Flags Magic Mountain, it’s your turn to tour the classic mansion and explore the unfinished renovation for yourself. Find your way out…the Willoughbys love it when you try to escape. 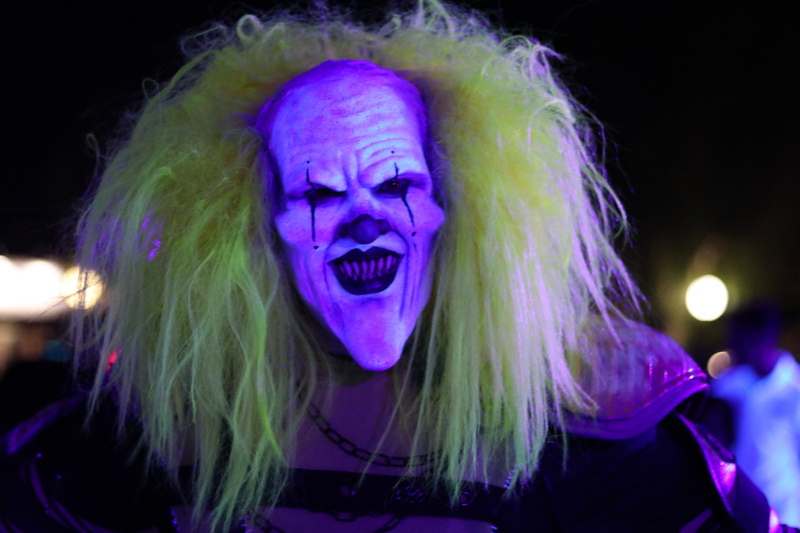 Willoughby’s Resurrected is your traditional haunted house (quiet literally) at the end of a street! We think this is rather fun with its mix of beautiful sets, live actors and technology. You can find multiple scares in each room which allows for scares for the front and back of groups. More often than not, you find one scare in mazes and people are sometimes left without any experience, but this maze is so different. We jumped multiple times at the mechanical scares as well as the jump scares of those monsters jumping out from the shadows. 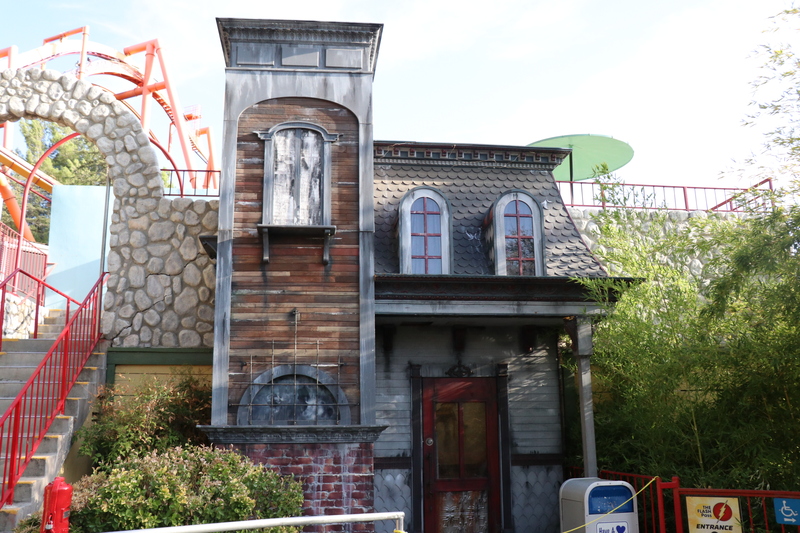 The only downside to the attractions was when a monster looked at Nikki in the eyes and said “eyes on me…eyes on me….eyes on me” which was out of character but also such a tell that there was going to be a scare coming from the other direction. Other than that one moment, it was a rather enjoyable experience all together. In the aftermath of a recent cataclysm, the region is overpopulated and under-resourced. A Renegade Faction is currently trying to take control of the city. Rumors abound that the Renegades plan to destroy the Bio-Containment Center. If they are successful, the Renegades will release an ancient parasitic virus and contaminate the local populace and allow them to overtake the city and the already infected patients may also be set free. 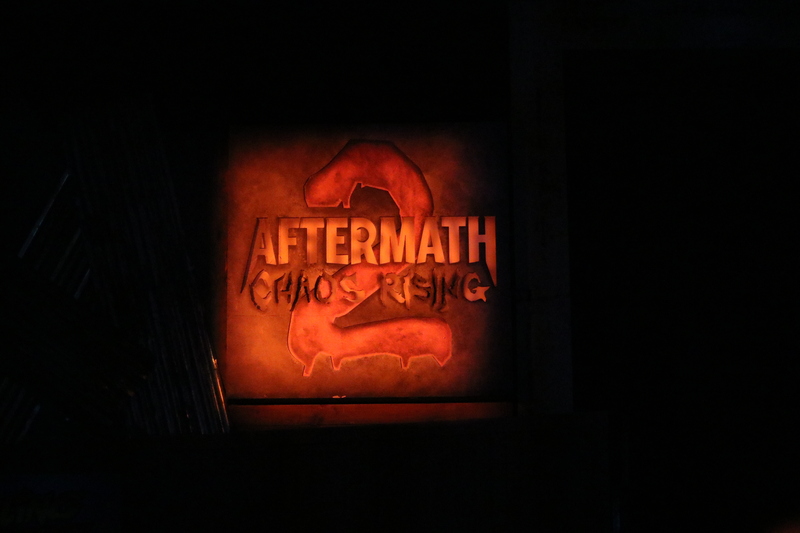 Will you survive Aftermath 2: Chaos Rising, the park’s largest outdoor maze ever built? Aftermath 2 is the longest maze I have ever experience. Usually large mazes tend to lose their impact and pace the further you get along. But SFMM keeps the pace with plenty of talent and large fire blasts that happen incredibly close! The music, sound effects and screaming police characters really create a sense of urgency. One thing I really enjoy about this attraction is it’s use of open space. At certain points through the maze, you are given a choice of directions because of obstacles in your path. I think this is rather fun because it can really help create incredible moments of interaction with monsters. Imagine separating by accident from your group as they go on one side of a broken down burned car and you go on the other. They get past, but you are met by a monsters. How unnerving can that be!? 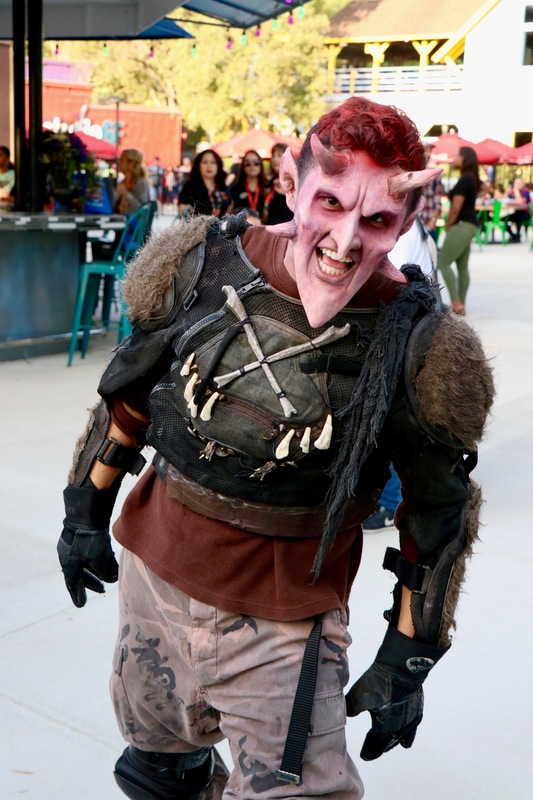 Although this maze is extremely fun, I do wish that the monsters had more make up and I wish there were more with masks on like the one on stilts pictured below. Overall, I think this is a fun and spooky maze that can be really enjoyable. Apparently on opening night, this area was missing a few people to help it run smoothly. After speaking with some staff as well, they are working dialing it in even more. 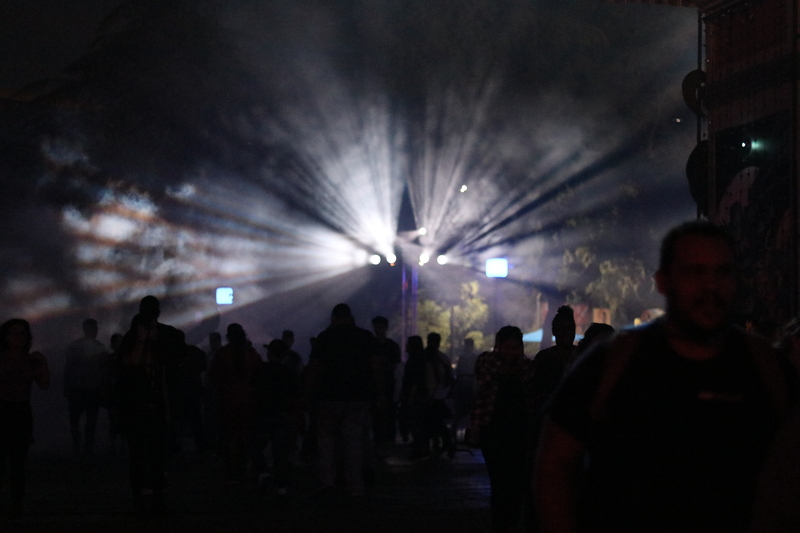 But with that being said, we still love this new scare zone. Although it may not have changed through the night, the changes it did have were very fun. 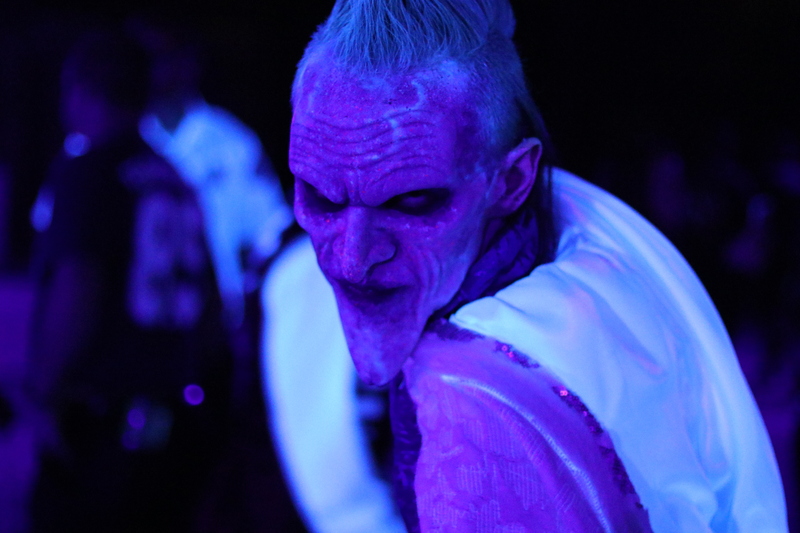 When the blacklight turned on and revealed the different make up jobs that were on each monster, it was like a whole new scare zone. We have to give kudos to the many monsters working this area, because they are what really made it awesome. Without them, this could have been a low energy boring scare zone. But, they kept it up all day long and had people running in fear! Truly a talent driven scare zone. We had only one issue with it, and that was the lack of decorations, sets and props. Because of this, the monsters basically were just walking in circles through the crowd. You can get some scares from that, but nothing like jumping out at someone. Hoping that next year, they up the decorations in the area. With that, I think this can be a very strong scare zone that has staying power. In the distance is an old abandoned facility that has recently been discovered with years of secrets of the unknown. If you dare to enter, be aware of your surroundings at all times. 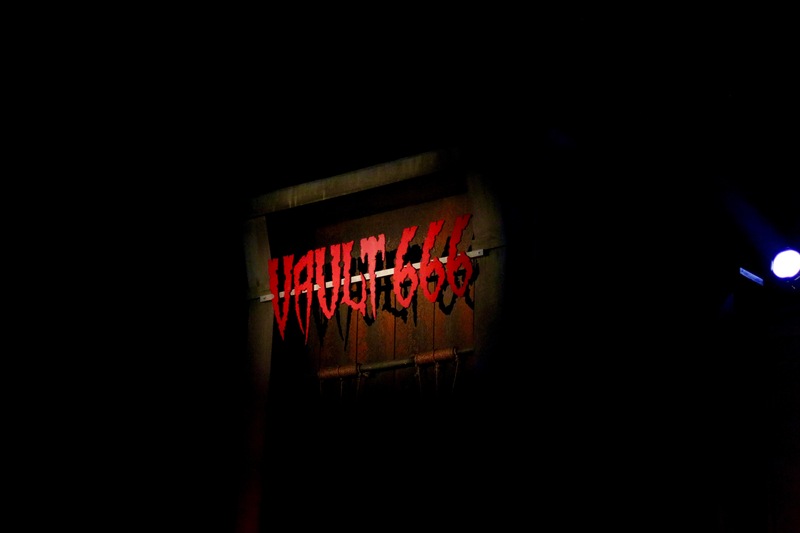 Unknown animal like screams have been heard deep within the unsecured vault. 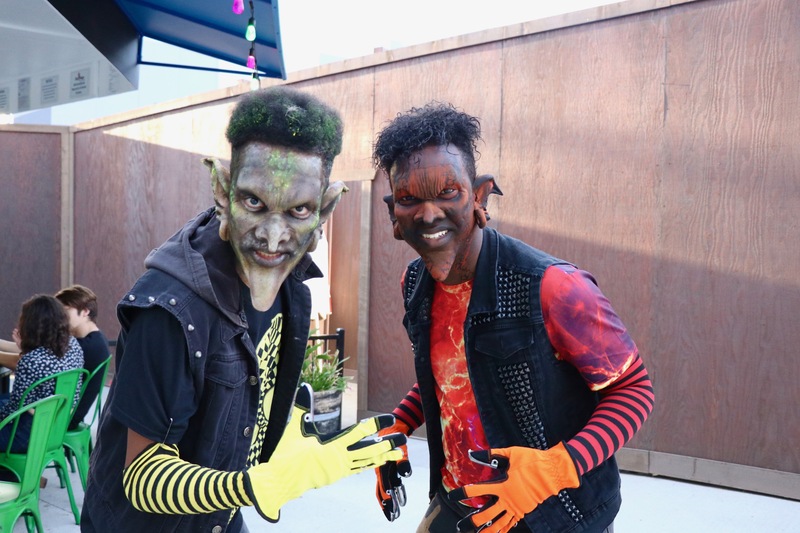 Only at Six Flags Magic Mountain’s Fright Fest. Some try their hardest to get out…. but it always was too late. Will you escape Vault 666? Who doesn’t like a little animal human hybrids? I know we love it! 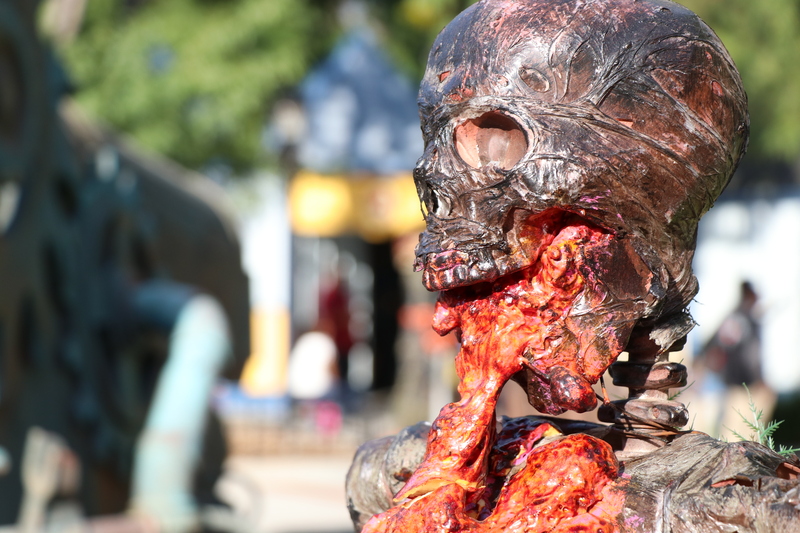 This maze is gore filled, scary, and rather disturbing! Unlike other mazes, these three all have pre-show rooms before heading into the maze itself. In Vault 666, we are visiting a facility and we need to go through a security check. During the security check, something goes wrong and a man is attacked by animal human hybrid! Then we are told to get out, but through the facility! It’s campy horror goodness at it’s best! We got scared multiple times in this maze and also go the heebie-jeebies pretty bad. Especially when we got monsters making noises right behind us! 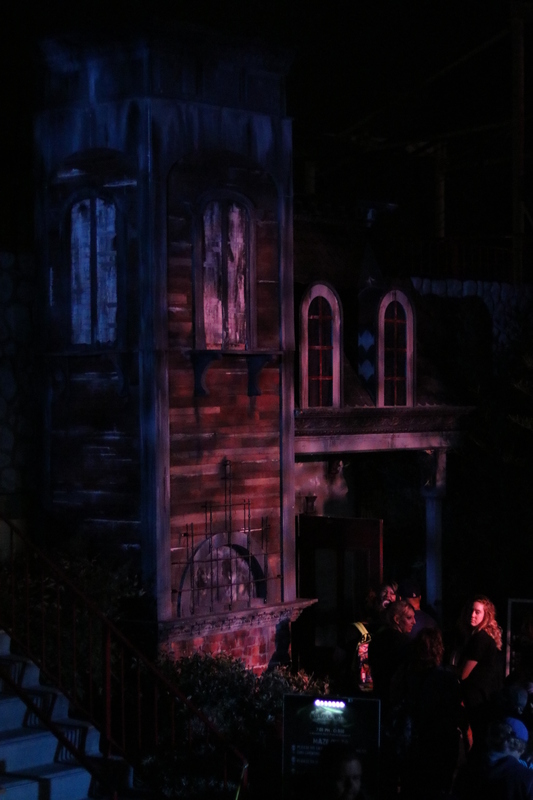 The sets were also very detailed and were designed well to help facilitate the scares. The park now stands where a wooded forest once thrived, during a time when fairy tales were more than stories, but more like reality. And within the forest one would find a village of hardworking people who kept quietly to themselves and hidden from the outside world. The wisest elder of the village predicted the village could be plagued by an evil force and to prevent it, they should all be wary of outsiders. The villagers heeded the advice of their elder and shunned all those that would pass by their village. One dark and stormy night, Little Red Riding Hood was running through the forest trying to escape the thunderous growls of a wild beast she had stumbled upon while on her way to visit her grandmother. Crying frantically, she banged on the villager’s doors and windows. She ran from door to door begging for help, and no one came to her aid. With one last gasp, she tried to break a window. It was too late. Teeth filled her neck and at the same moment, her guts were flowing onto the ground, staining her picnic basket. By morning, the storm had washed away the blood stains, and the beast had finished off her body. Tonight is the night for Red’s Revenge! This is based on a classic story that everyone is familiar with, Little Red Riding Hood. But she isn’t so little anymore. We love when haunts take familiar bed time story or fairy tales and bastardize them so they become twisted and disturbing. Out of the three mazes in this area, this has to be my favorite! I love the concept, the idea and the execution. One room in particular that stands out is a tunnel you have to walk through with Red Riding Hood herself above you! 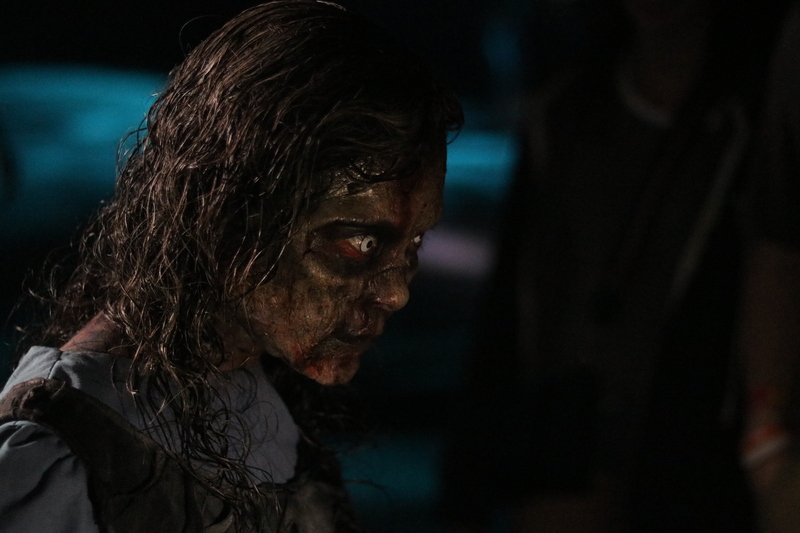 It’s rather epic and gives the character a moment so guests can see her, because she is the main character of the maze. I was in the back of the group for this maze and got scared so many times! The talent was killing it! We would love to see this maze get some love next year! Update effects, sets, costumes, and scares to take it to the next level. Fired from his long time job at the factory, the crazy inventor craved revenge on anyone who dared to enjoy his toys. He was going to prove that the toy factory would be a complete disaster without him and his amazing creations. During a recent tour of the toy factory, he unleashed his wrath. As the tour guide began to conclude the tour, the lights flickered briefly before crashing to the ground, crushing the tour guide and most of the visitors. The whole factory fell into darkness as creepy laugh came over the sound system. 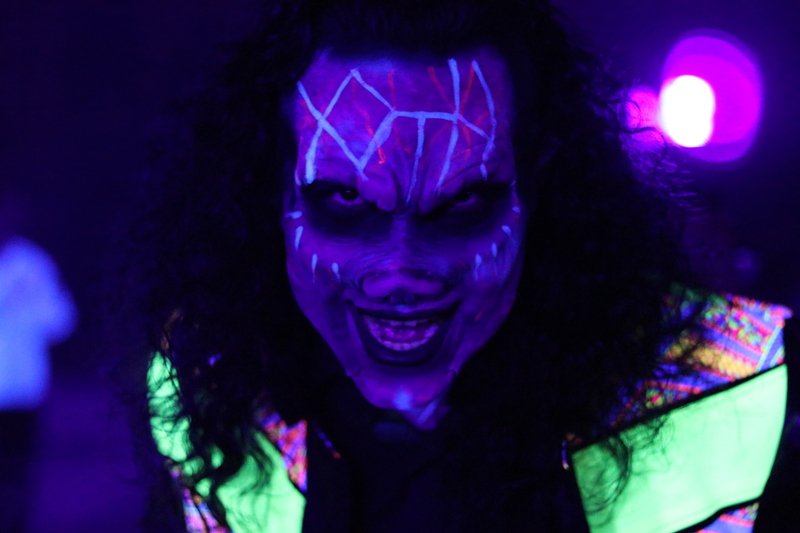 The inventor’s voice announced that the factory’s guests were about to have the “fright of their life.” Brandishing a glow toy to scope out the area and see his revenge unfold, it was clear that all the guests were dead in a puddle of blood. Wicked windups, freakish plush, and deranged dolls had taken over the factory and their plastic spirits are full of evil and hatred towards humans. Out of the three mazes, this was the most fun. 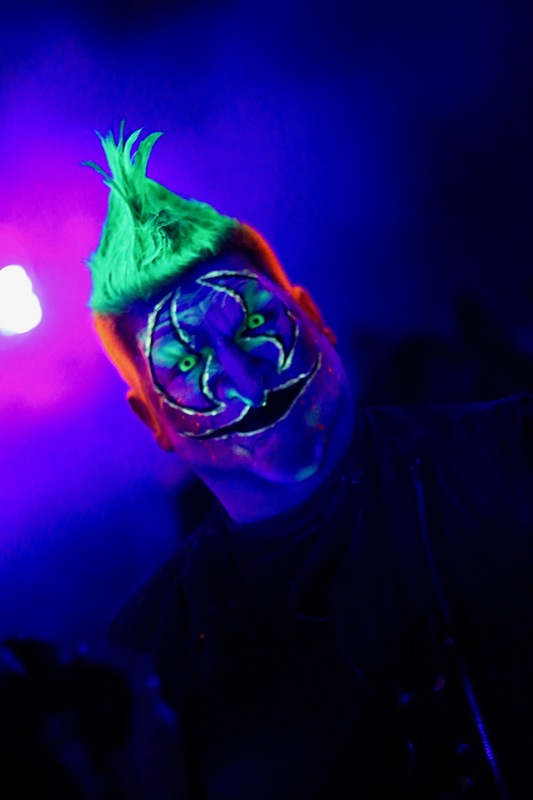 I know a lot of haunt fans that do not like 3D mazes. But we find them to be really entertaining! With the added theming of clowns and toys, it really sets the tone! 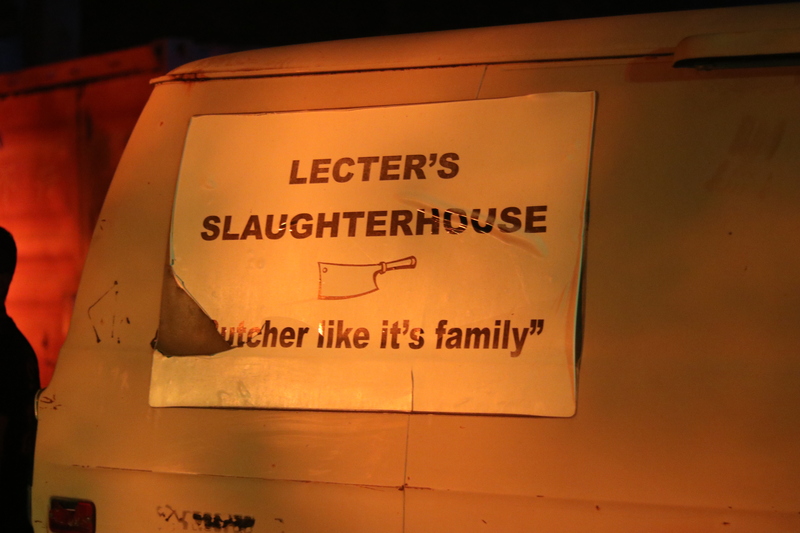 As stated before, this maze also had a pre-show room where you are filled in on a bit of the back story. As you enter what looks to be a toy workshop, there is a platform in front of you that is obviously going to be used for a scare. It does, but it is the perfect spot to scare people from behind. Since there seems to be a stage, people instinctually face it, get them from behind! The maze was not entirely scary, but there were plenty of moments that some of the actors were making ungodly noises that we couldn’t stop talking about. When it comes to creating mazes, they don’t always have to be the scariest thing you have ever been through! Just as long as you leave an impression on people, creep them out and make them think about you way after they leave the maze. This is what happened to us and I keep thinking of that noise. A hard working farmer was sleeping in his room when he was awakened in the middle of the night by whimpering cries from the fields. His chickens squawked, pigs snorted, and the cows expressed their most panicked moans. Worried, the farmer put on his boots and headed towards the barn to investigate the panic. When he passed the sheep pen, he stopped as the full moon lit up the sight in front of him. There lying on the ground were four dead sheep. Noticeable puncture wounds caught his eye and he then realized they had been drained of their blood. The farmer turned to run towards the house to grab his trusty shotgun, but he froze when he saw the hideous figure in front of him. It stood on two feet and its orange eyes glowed in the darkness. It leaped towards the farmer, extending its claw-like hands, hissing as it bared its sharp blood-stained fangs. As he stood there, frozen in the pain, he could feel the monster’s warm foul breath on his face, and he saw the quills sticking up on the back of its gray neck. The farmer struggled to escape as he realized he had come face to face with the legendary Chupacabra. 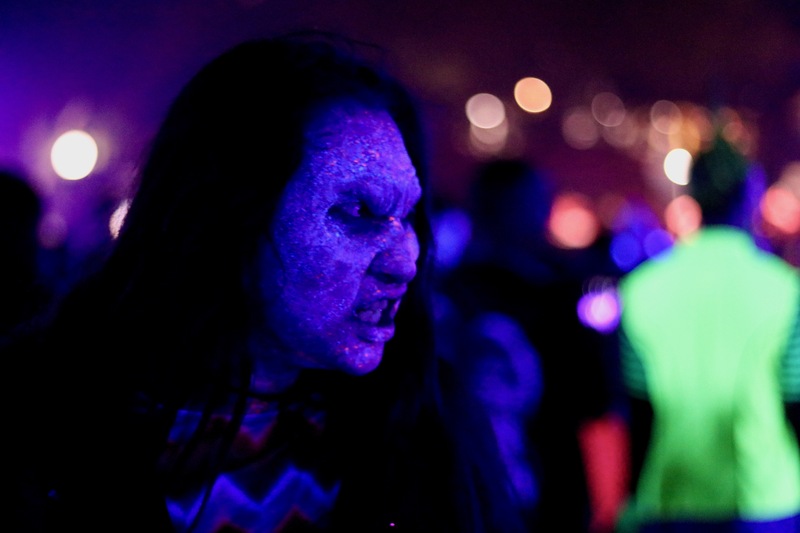 Are you prepared for your encounter with the Chupacabra? Oh man where do we start. After having gone through three incredible mazes, Chupacabra just falls flat. Not much to say here but this maze needs some major changing. 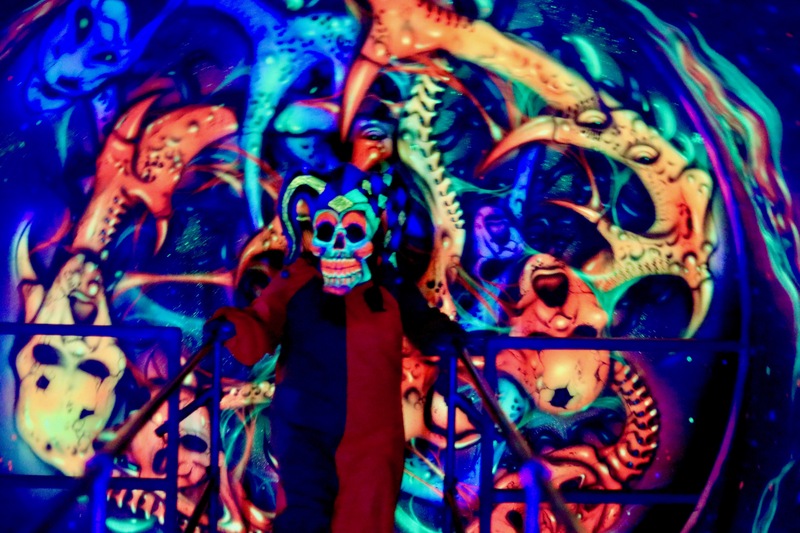 Although I love the theme and its connection to Mexican folklore, it can be so much better than it is! You should feel like the Chupacabra is around every corner, stalking you! 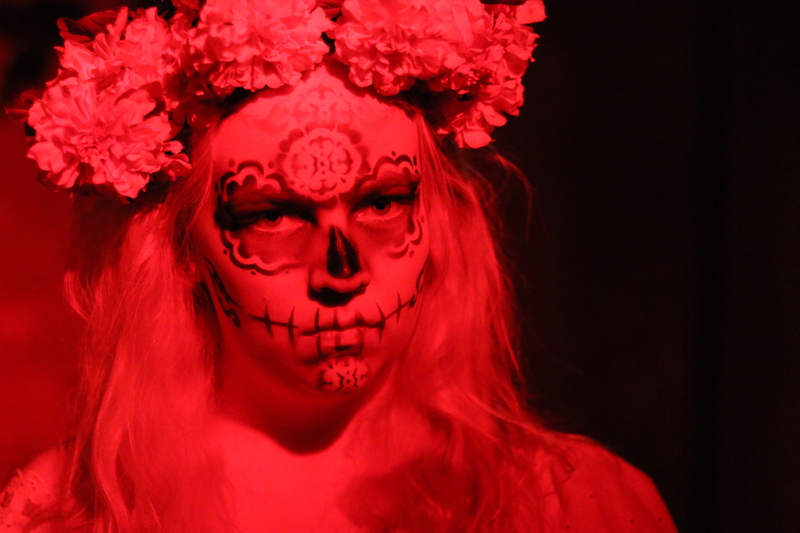 But what we get are some werewolf creatures and people in Dia De Los Muertos makeup. I also asked the people around me if they had seen the actual Chupacabra, but nobody did! I really wish this one was better. We finished our night checking out the two remaining scare zones! 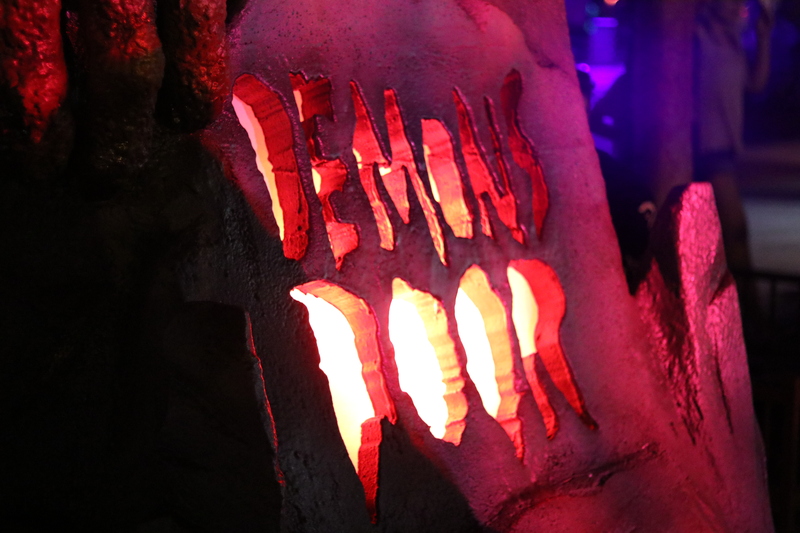 Demons Door was a favorite of ours from last year and we really hoped it would return. 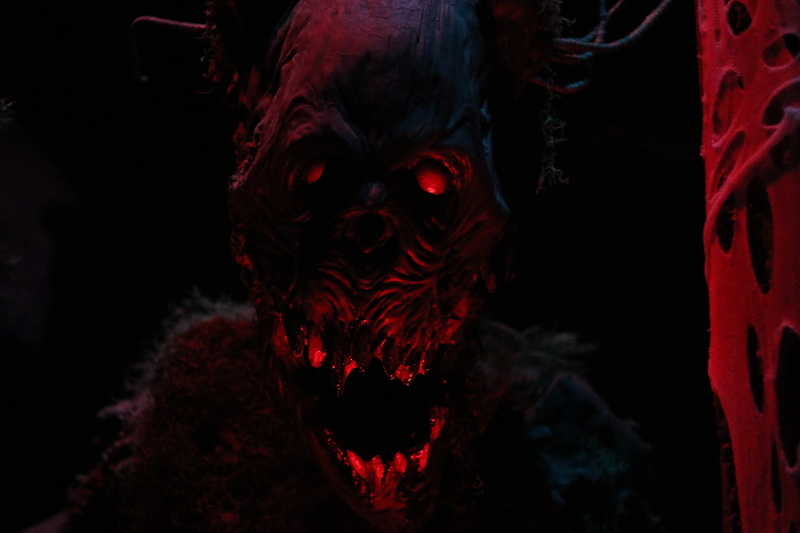 The haunt Gods shed their creepy light and we were lucky enough to have it back again! 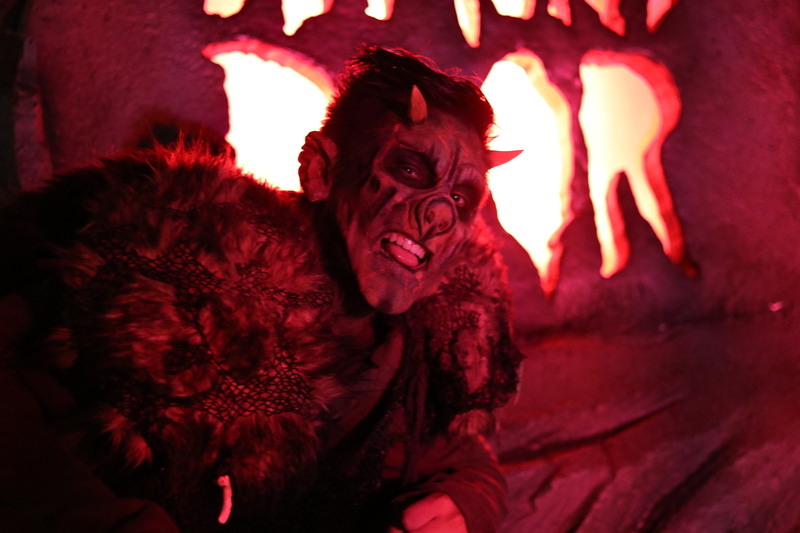 A wonderfully imposing scare zone to start your adventure into SFMM, Demons Door houses multiple demons, lurking around every corner! They just seemed to be everywhere all at once. If you don’t pay attention, you might just be staring at one of these demons in the eyes when you turn around. 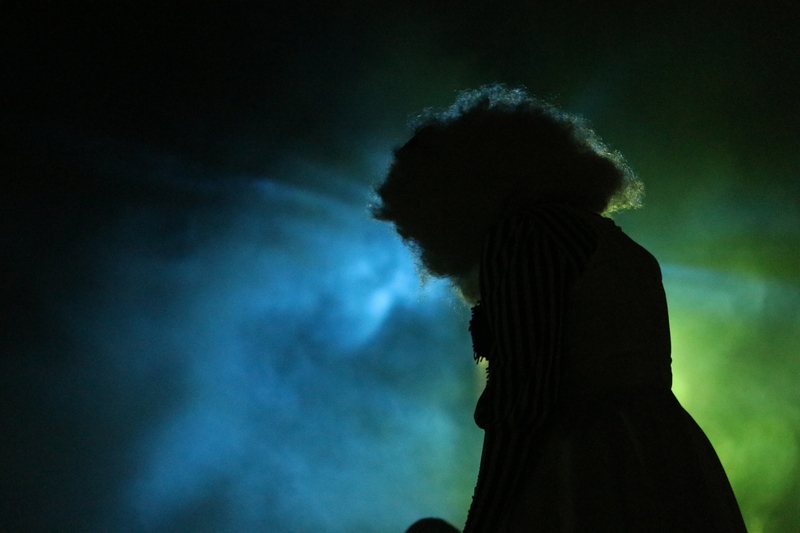 This evil nightmare has never been so edgy as your favorite bedtime stories take on a haunting and twisted glow. 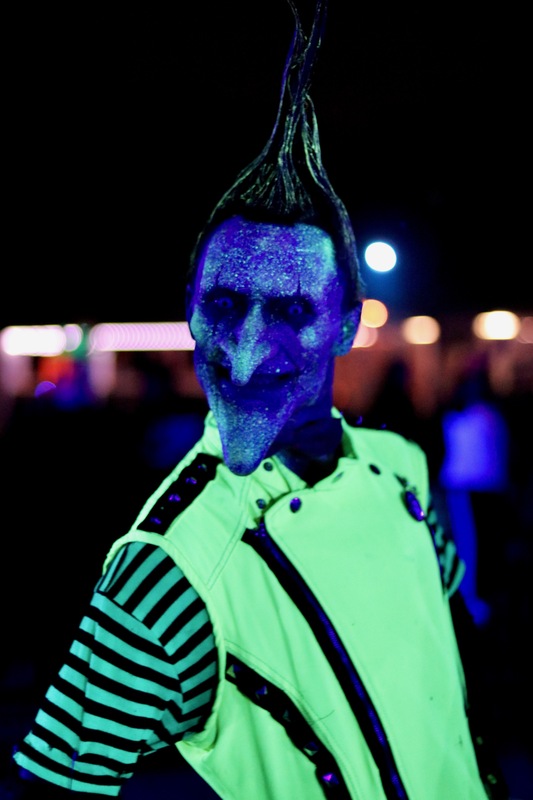 These creatures seem friendly at first, but don’t let their sweet glow fool you. They would like nothing more than to show you the end of their story. 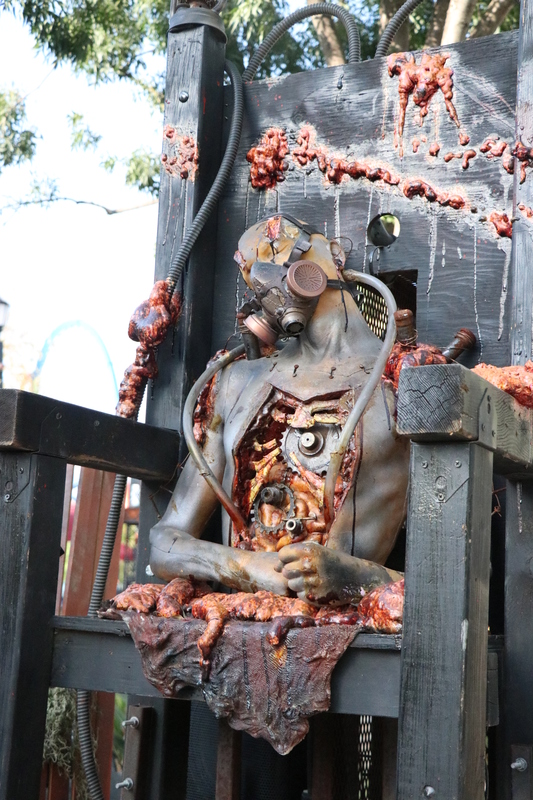 This scare zone is just plain awesome! So many wonderful characters and monsters! Many of which actually talk to you. 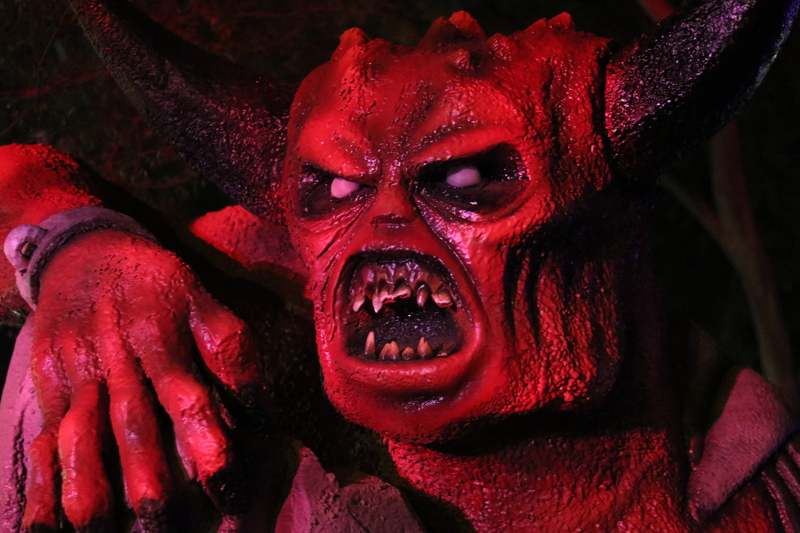 We found it rather easy to spend a lot of time in this scare zone given its detailed decor, amazing lighting and monsters. I remember just standing there watching the monsters do their thing. After analyzing the space, I noticed the scare zone doesn’t take up much space at all! But the monsters make it their own and make it feel much bigger. 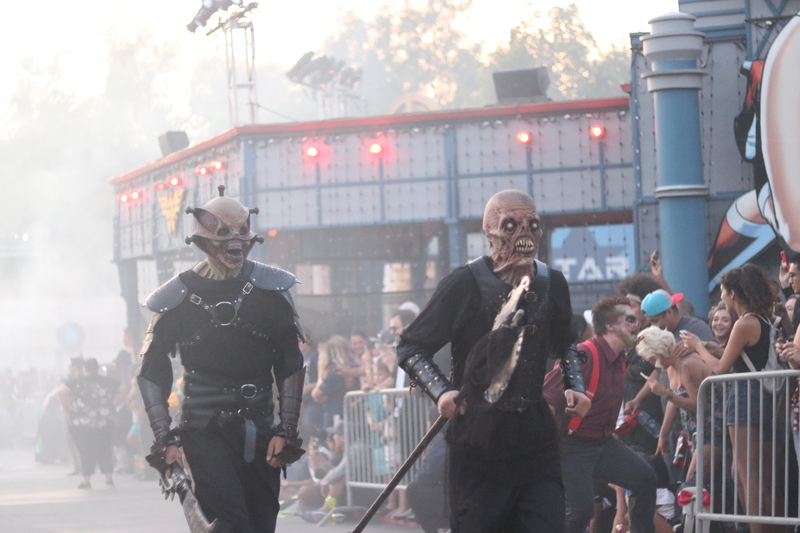 Overall, Six Flags has another successful year on its hands with Fright Fest! 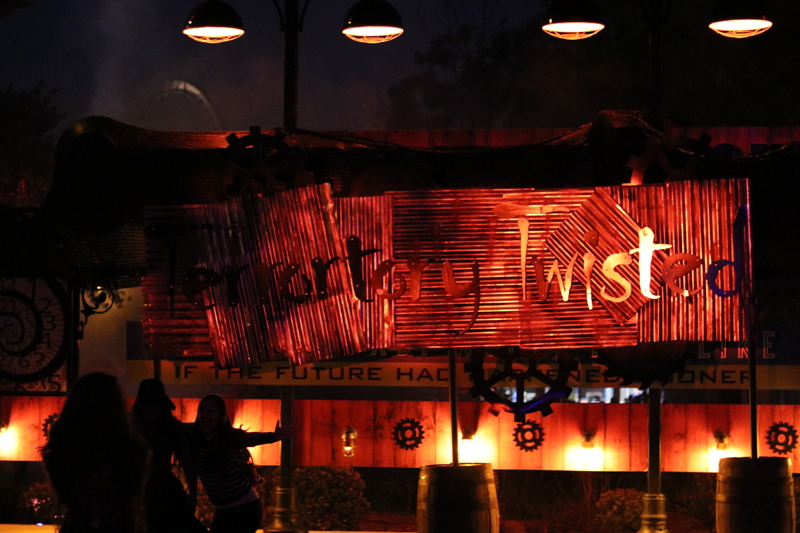 Although there were a couple misfires, they have plenty of scary goodness to go around for everyone! What we actually love about this event is how well balanced it feels. 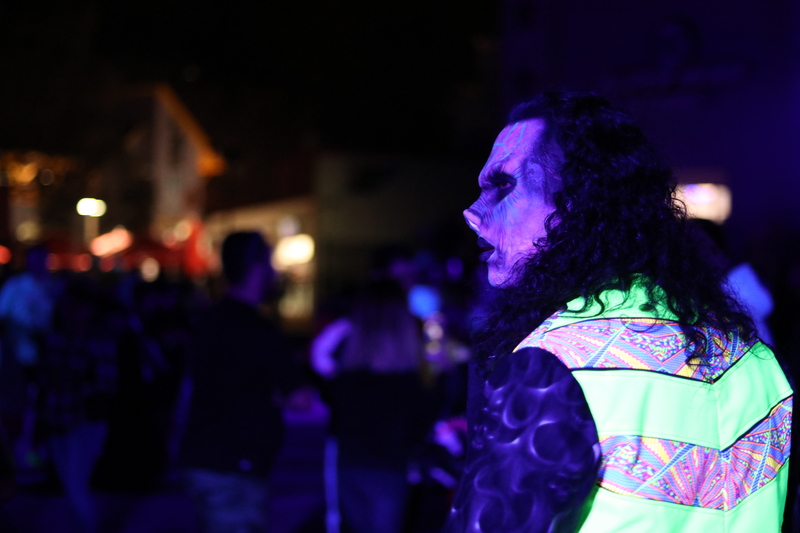 We didn’t cover it in this piece, but there is some really fun live entertainments outside the scare zones, and mazes. Also, lets not forget the world class line up of coasters that you can ride in the dark! 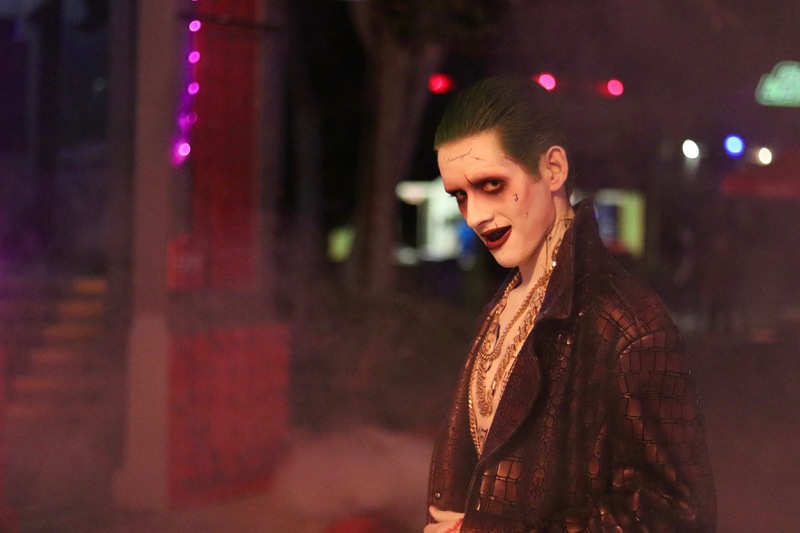 On top of that, the event covers many topics and concepts with its mazes and scare zones that everyone will find something they like at Fright Fest. Also with regards to our criticisms of our visit, we know this is opening night! There are some many things that can be tweaked, improved upon and changed over the days to come. So many some of the things we didn’t like will change and become better than ever! 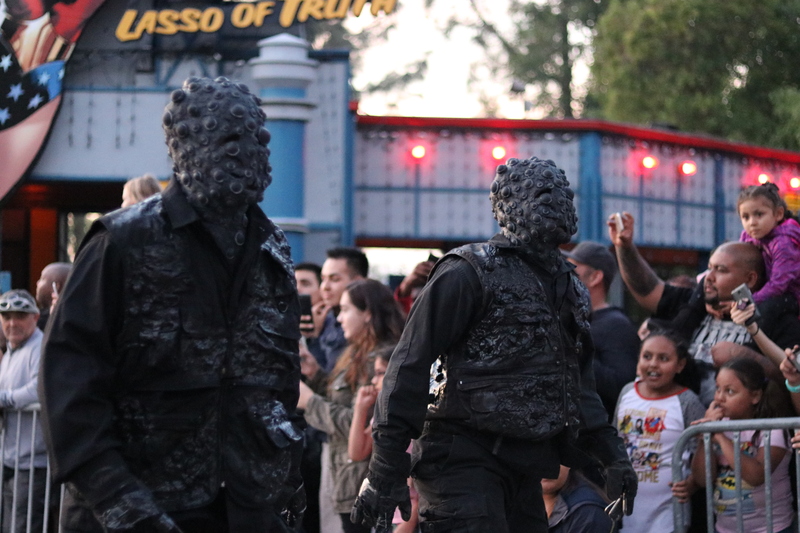 With that being said, we are excited to see what the SFMM team thinks up next for Fright Fest and the Fright Fests to come! 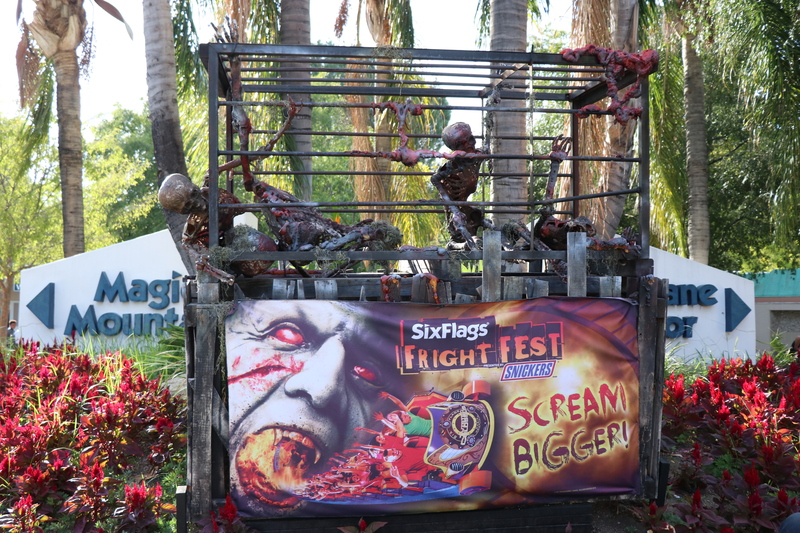 Make sure to head over to Sixflags.com for more information on Fright Fest and how you you can purchase your tickets! 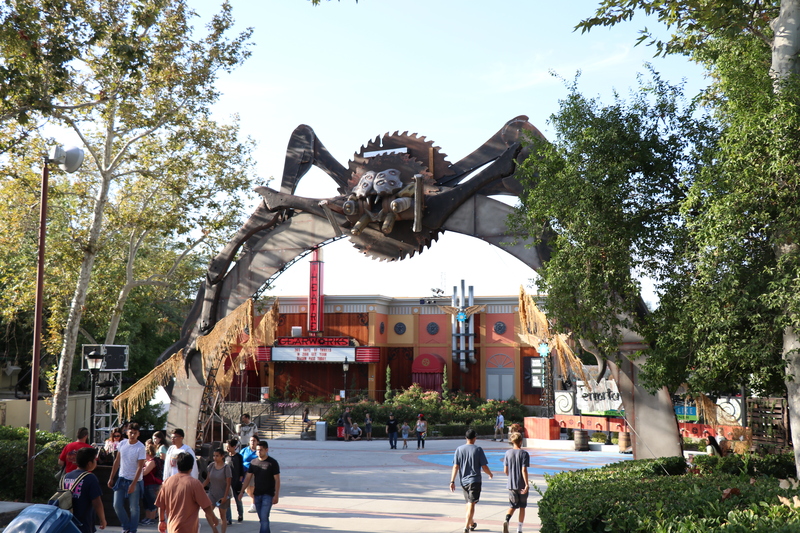 A Visit in Picture: Six Flags Magic Mountain Fright Fest!